AB = Air Base; AAB = Army Air Base; AAF = Army Air Field; AAFB = Army Air Force Base; AD = Air Depot; AF = Air Field; AFB = Air Force Base; AFRB = Air Force Reserves Base; AFS = Air Force Station; AFX = Air Force Auxiliary; ALF: Army Landing Field; ANGB = Air Natl Guard Base; ARB = Air Reserves Base; AS = Air Station; ATC = Air Transport Cmd; Aux = Auxiliary; CCTS = Combat Crew Training Site; CPT = Civil Pilot Training; ELF = Emergency Landing Field; FF = Flying Field; FS = Flight Strip (Aux); ILF = Intermediate Landing Field; OTU = Operational Training Unit; TCC = Troop Carrier Cmd. (Note: Many of the ILFs were originally DoC civil emergency fields.) Brown type = namesakes. NOTE: To simplify researches, coordinates [in brackets] are classic spherical degrees, minutes, and seconds (dd-mm-ss). For Google Earth use, any dashes need to be replaced by a space, and an N-comma and a W addedeg: 37 00 00N, 121 00 00W. Aberdeen AAF aka Phillips Field, Aberdeen Proving Gound MD (19??). 49 Bomb Sqn (1931). Abernathy Aux #A-1, TX. Satellite for Lubbock AAF. Abilene AAF, AB, TX (1942-1956). 12/6/56: Renamed Dyess AFB. Acquilla Aux #4, TX. Satellite for Waco AAF. Adams Field, Little Rock AR. Advance ILF. MO [37 07N, 89 56W]. "0.5 mi W of town" [37 06 05N, 089 55 21W] ?. Alamogordo AB, AAF, NM (1942-1948). 1948: Became Holloman AFB. Albany AFB, GA. Transferred to USN as Albany NAS. Albuquerque AAB see Kirtland Field. Alessandro Flying Training Field, Riverside CA (1918-1918). 5/20/1918: Became March AFB. Alexandria AAF, Pitkin LA (1939-1946, 1950-??). CCTS. Bombing ranges at Angelina TX, Boykin Springs TX, McGee Bend TX. 1950: Reactivated as England AFB. Allen AAF aka Big Delta AAF, Fort Greely, Delta Junction AK (19??-1948). Joint military and civil use. Allen Aux, Maricopa CA [est: 35 03 07N, 119 01 13W] (1946-19??). Gardner Field's satellite. Alliance Aux #4, FL. Satellite for Marianna AAF. Alma ILF, GA [31 32 09N, 82 30 23W]. Became civil Bacon Co Airport. Altus AFB, OK (1953->). SAC base; C-5 and C-141 tng. Amarillo AAF, AFB, TX [35 13 07N, 101 42 21W] (1942-1947, 1951-1969). Basic troop tng; Mechanic School #12. 1951: Reactivated as AFB. 1969: Deactivated. Amboy Aux [34 33 39N, 115 44 57W] (1942-??). Satellite of Patton AAF; supply field for Gen George Patton's desert tng areas. Amchitka AAB, AK (19??). To AFB (1/13/48-??). Amedee AAF, Sierra Army Depot, Herlong CA [40 08 20N, 120 10 40W] (19??-1995). To Nevada ANG (1996->). Americus Air Intermediate Depot, GA (c.1920-??). Supply Depot. Andrews Field AFB, Camp Springs MD (3/31/45-1948). Was Camp Springs AAF (5/2/43-3/31/45). HQ Command base. 1948->: To AFB. Home base of presidential Air Force One (1961->). LtGen Frank M Andrews, USAAF. Annette Island ILF, Metlaktia AK. Anniston AFB, Eastaboga AL (19??-1952). Satellite for Courtland AAF. Apalachicola AAF, FL. Satellite for Tyndall Field. Aragon Aux #A-5, TX. Satellite for Marfa AAF. Ardmore AAF, AFB, OK (1942-1945, 1953-1959). 8/3/42: CCTC; combat glider sqdn, gunnery ranges. Bombing ranges at Pontotoc Co #1 and #2, Coal Co #3 and #4, Johnson Co #5. 10/31/45: Deactivated and remanded to the city as Ardmore Industrial Airpark. 9/1/53: Reactivated as AFB; TCC. 3/31/59: Deactivated, reverted to civil Airpark. Arlington Aux #4, CO. Satellite for La Junta AAF. Arlington ILF, OR [45 43N, 120 10 30W] (19??-??). 19?? : Became Arlington Muni. Arlie ILF, TX [34 40N, 100 08W] (19??-19??). Arnold AFS, AFB, Tullahoma TN (1/1/1950-->). 8/17/94: To AS. 9/28/95: To AFB; Arnold Engineering Development Center. Gen Henry H Arnold, USAAC/USAAF/USAF. Artesia Aux #6, NM [32 51 08N, 104 28 02W]. Satellite for Roswell AAF. 19?? : Became Artesia Muni; aka Roswell Aux #7. Ashburn Field, Chicago IL (c.7/x/1916). Aviation Section Flying School, the Army's third training facility. Athlone Aux #4, CA. Satellite for Merced AAF. Atlanta AAB, GA. Is Atlanta AAF aka Morris AAF, Forest Park GA? Atlantic City Airport, NJ (1960s). SAC/USAF dispersal site. Atterbury AAF, AFB, Columbus IN (12/31/1942-1954). CCTS and satellite for George Field. 1/13/48: To AFB. 11/1/54: Renamed Bakalar AFB. 1972: Became Columbus Muni. Aurora Aux, CO. Satellite for Portland AAB. Autaugaville Aux #5, AL. Satellite for Craig Field. Avalon Aux, MS. Satellite for Greenwood AAF. Avenger Field, Sweetwater TX. Satellite for Abiline AB. Avra Aux #4, Tucson AZ. Satellite for Marana AAF. Avon Park AAF, AFS, AFX, FL (19??-??). CCTS; bombing range. 1/13/48: To AFS. Baer Field, Fort Wayne IA (19??). TCC. To AAB (19??).. Bainbridge AAF, AB, GA (8/x/1942-1961). Primary and basic flight tng; also camp for German POWs. Became an industrial complex. Bakalar AFB, Columbus IN (1954-1971). Was Atterbury AAF. Lt John E Bakalar, USAAF. Bakersfield Muni Airport, CA [35-25, 119-03]. Satellite for Hammer Field. Baldsteifen AFX aka Eglin AFB Aux #8. Ballico Aux #2, Merced CA. Satellite for Merced AAF. Bangor ANGB, Bangor Intl Airport ME (19??->). Air refueling and airlift station. Dow Field? Barking Sands AAF, AFB, Kauai HI (1953-1964). Originally built by US Army as Mana Airport (1940), then Mana Airfield Military Reservation (194? ), Barking Sands Military Reservation (19?? ), Kekaha Military Reservation (19??-53). 5/8/53 (?>1964): Renamed Bonham AFB. 19?? : Transferred to USN. 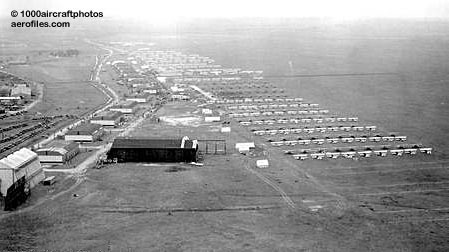 Barksdale Field, AFB, Bossier City LA (2/2/1933-->). SAC base; CCTS. Bombing ranges at Kisatachie and Minden LA. 19?? : To AFB. Lt Eugene H Barksdale, USAAC test pilot. Barnwell Muni Airport, SC. Satellite for Columbia AAB. Bartow AB, FL (19??-1961). Primary and basic flight tng; CCTS. Bombing ranges at Lacoochee and Lake Hancock FL. Bascom Aux #3, FL. Satellite for Marianna AAF. Batesville ILF, MS [34 18 00N, 90 00 30W] (19??-??). Battle Mountain FS, ILF, NV [40 36N, 116 52 15W] (19??-??). Satellite for Reno AAF. 19?? : Became Battle Mountain Airport. Bay Aux #3, Courtland AL. Satellite for Courtland AAF. Beale AFB, CA (1948->); was Camp Beale (1942-1948). Gen Edward Fitzgerald Beale, landowner, Indian agent, and founder of Army Camel Corps. Beardsley Aux #2, AZ [32 42 14N, 112 25 04W]. Satellite for Luke Field. Bellows Field, AFS, Oahu HI (1933-1958). Built on Waimanalo Military Reservation, established in 1917. 1958: To AFS. Lt Franklin Barney Bellows, WW1 pilot. Bemis(?) Aux #3, GA. Satellite for Moody Field. Benjamin Harrison SEE Schoen Field. Berlin Aux, GA. Satellite for Spence Field. Biancur AFX aka Eglin AFB Aux #6, FL. Bicycle Lake AAF, CA [35-17, 116-37] (19??-??). Satellite for Natl Tng Ctr and Camp Erwin. 8400' paved rwy. Big Delta AAF see Allen AAF. Big Pine Aux, CA [37 08 46N, 118 14 21W]. No data. Big Spring AFB, AAF, TX (9/28/1942-1952). 15 bombing ranges. 1952: Renamed Webb AFB. Bilbo Aux #3, Calera OK. Satellite for Perrin AAF. Billings Muni Airport, MT (1960s). USAF dispersal site. Birmingham AAB (Muni Airport), AL [33 33 46N, 86 45 13W]. Bishop AAF, CA [37 22 20N, 118 21 46W] (194?-4?). Black Hill AAF, Black Hill Ord Depot, Igloo SD. Blackstone AAF, VA (1942-??). Camp/Fort Pickett satellite. Shared civil as A C Perkinson Airport (19??). Bliss Field see Fort Bliss. Bluethenthal Field, Wilmington NC. CCTS; fighter gunnery tng. Blythe AAF, CA [33-37, 114-43]. Satellite for March AFB. CCTS. Boca Raton AAB, FL. AAF Tech School, Radar Operator tng. Bolling Field, AFB, Washington DC (4/1/1918-1947). HQ Staff. Gunnery and bombing range at Sharps Island MD. 1947: To AFB. 1962: Moved fixed-wing operations to Andrews AFB. Col Raynal C Bolling, USAS. Bonham AFB, Kauai HI (1964-??) (?>1953--). Was Barking Sands AAF. Bowman Field, Lexington Muni Airport KY (19??-19??). 1931: To ILF. Bradley Field, Windsor Locks CT. Fighter combat tng. Breckenridge AAF, Camp Breckenridge, Morganfield KY.
Breckenridge Aux, OK. Satellite for Enid AAF. Brinkley Field, ILF AR [34 53N, 91 10 30W] (19??-??). 19?? : Became civil Federer Memorial Airport. Brocksville Aux, FL. Satellite for MacDill Field. Brookley Field. AFB, Mobile AL [30 37 57N, 88 04 16W] (19??-1969). Was Bates Field. 19?? : To AFB. Capt Wendell H Brookley, USAAF. Brooks Field, AFB, San Antonio TX (12/5/1917). Was Gosport Field (1917) and Kelly Field #5 (1917-18). Primary tng; school of avn medicine; Border Patrol station (1931). 19? ?->: To AFB. Cadet Sidney J Brooks Jr, USAS. Brooms Aux #2, TX. Satellite for Goodfellow Field. Brownsville AAB, TX. Tow target gunnery tng. Bruning AAF, NE [40 20 16N, 97 25 47W] (1943-1945). 8/28/1943: Combat tng, P-47. Hvy bomber group, B-24. 11/21/45: Closed and remaned to the state. Bryant AAF, Fort Richardson, Anchorage AK. Buchanan Field, Concord CA [37-59, 122-03]. Buckeye Aux #5, Palo Verde AZ [33 25 14N, 112 41 05W]. Satellite for Luke Field. Buckingham Field, AAF, Fort Meyers FL (1942-c.1946). Flexible gunnery tng. Buckley Field, AFB, Aurora CO [39 42 54N, 104 45 28W] (1943-2000). Tech Tng Ctr. 10/1/00->: To ANGB. Lt John H Buckley, USAS/NG. Buffalo AAF Factory Tng School, NY. 14th AF Curtiss tech tng. Buffalo Springs Airport, Santa Catalina CA. Satellite for March Field. Bullseye Aux SEE USAF Academy. Bunker Hill AFB, Peru IN (1954-1968). Was Bunker Hill NAS (1942-46). 6/2/1954: Activated. 5/12/68: Renamed Grissom AFB. Burbank (United) see Lockheed Air Terminal. Burgess Field, Uniontown PA (c.1930), ILF. Burlington Airport, VT (19??). To ANG (1946->). Burnt Gin Aux, Sumter SC (19??-1945). Satellite for Shaw Field. 9/12/45: Surplused. Burton Aux #4, Ambrose TX. Satellite for Perrin AAF. Bushnell AAF, FL. Satellite for Orlando AB. Butler Field, ILF, GA [32 34N, 84 14W] (19??-??). 19?? : Became Butler Muni. Butte Aux #A-7, TX. Satellite for Pecos AAF. Butts AAF, CO [38 40 46N, 104 45 29W] (1963-->). Fort Carson satellite. Byrd Field, Richmond VA (1960s). USAF dispersal site. Cade Aux #2, TX. Satellite for Randolph Field. Caddo Mills Aux #1, TX. Satellite for Majors Field. Cadiz Aux [34 30 50N, 115 31 10W] (1942-??). Satellite for Patton AAF; supply field for Patton's desert tng areas. Cairns AAF, Fort Rucker, Ozark AL. MajGen Bogardus S Cairns, US Army. Cal Aero Academy, Ontario CA. Contract CPT pilot tng. Became Ontario Muni. Cal-Aero Field Chino [33 58 30N, 117 38 12W] (19??-19??). (1950 data): 7 mi SSW of town; elev: 625; 4700' p. 19?? = Became Chino Muni. Caledonia Aux #3, Aberdeen MS. Satellite for Columbus AAF. Camp Ashland see H J Paul AAF. Camp Barkeley see Tye AAF. Campbell AAF, Clarksville TN (1942-1946). Specialist tng. Sub-base for Smyrna AF. Campbell AFB, Fort Campbell KY (19??-->). c.1959: To AAF. Campbell Aux #4, CA [-?-]. Satellite for Chico AAF. Campbell Aux #6, MO. Satellite for Malden AAF. Camp Davis AAF, Holly Ridge NC (4/x/1941-1944). Barrage balloon school, OCS, and anti-aircraft tng base had two aux runways. WASP pilots arrived 7/24/1943 to tow targets with A-24s and A-25s. (6/1/1946-1948) Camp transferred to USN/USMC. Camp Drum see Wheeler-Sack AAF. Camp Edwards see Otis Field. Camp Essex AAF, Goffs CA [34 46 18N, 115 13 14W] (2/5/1942-3/16/1944), Support field for Army's Desert Training Center at [34 47 37N, 115 13 05W], commanded by Gen George S Patton at the onset. Land returned to Dept of Interior, presently reported to be a developing historical site and museum, perhaps in the town of Goffs. Airstrip became post-war civil Goffs (or Goffs #1), now unused and deteriorating, and traces of the encampment have nearly vanished. Camp Grayling see Grayling AAF. Camp Hood AAF, Killeen TX (19??). Renamed Gray AFB (1949). Camp Ibis, CA [34 58 34N, 114 50 22W] (1942-1946). 1942: Utility Army strip in desert warfare training area; 16 mi nw of Needles, 1 mi WNW of Camp Ibis HQ; elev: 1842; N 3900' d. 2006: Only traces remain of airfield and camp. Camp McCoy see McCoy AAF. Camp Pickett see Blackstone AAF. Camp Ripley AF, Little Falls MN (19??). Became Miller AAF. Camp Robinson AAF, Little Rock AR. In addition to training centers, the camp served as an WW2 internment compound for Italian and German POWs. After the surrender of Italy in 1943, many of the Italian POWs remained at the camp and joined US Army Service Units as service troops. Camp San Luis Obispo, CA [35 19 34N, 120 44 35W] (c.1950-1955). Army dirt aux strip for L-19 and helo operations; paved parade ground also used occasionally.--. Camp Shelby see Shelby AAF. Camp Springs AAF, MD (5/2/1943-3/31/1945). Became Andrews Field. Camp Stewart AFB, Hinesville GA. Was Stewart AFB. Camp Williams Camp Douglas WI, (1927-1935). Was Natl Guard rifle range and camp (1888). Extent of aviation activity, if any, unknown. LtCol Charles R Williams, USA. 1935: Runways built and became Volk Field ANGB. Cannon AFB, Clovis NM (1957->). Was Clovis AFB. TAC base; maintenance ground tng. Gen John K Cannon, USAAF/USAF. Cape AFB, Umnak Island AK (19??-1950). Carlisle Aux, AR. Satellite for Stuttgart AAF. Carlstrom Field, Arcadia FL [27 08 18N, 81 48 09W] (1918-1923). Embry-Riddle contract primary Army pilot tng; JN-4D. 3/x/1942: Reopened fro CPT flght tng. Lt Victor Carlstrom, pioneer aviator. 1947: Closed, property purchased by the State for Pierce Wood Memorial Hospital grounds. Google Earth icon as "Carlstrom Field" at [27 07 14N, 81 50 59W], 6.7 mi S of town, shows an open agricultural field. Carrier Aux, OK. Satellite for Enid AAF. Carswell AFB, Fort Worth TX (6/28/1942-1993). Was Griffiss AB. 1994: To USN. Maj Horace S Carswell Jr, USAAF. Cartwright Aux #3, Itasca TX. Satellite for Waco AAF. Casa Grande Aux #4, AZ. Satellite for Williams Field. Cash Aux #2, TX. Satellite for Majors Field. Castle AFB, Atwater CA [37 22 09N, 120 33 48W] (19??-1995). Was Merced AAF. SAC base. BrigGen Frederick W Castle, USAAF. 1995: Closed..
Castroville Aux #1, TX. Satellite for San Marcos AAF. Center Aux #2, Parma NM. Satellite for Deming AAF. Chanute Field, Rantoul IL (5/21/1917-1993). Technical Schools. Octave Chanute, aviation pioneer. Chapman Field, Miami FL [25 38 24N, 80 17 22W] (1918-1920, 1942-1947). 11/8/1918: Military reservation with runway and seaplane ramp saw little use as the war ended. Property was offered for sale but there were no takers (obviously no visionaries). c.1920: Abandoned and taken over by the Dept of Agriculture, also used as temporary storage depot for WW1 surplus; a few Army bombers from other bases used the runway occasionally for practice landings. 1942: Reactivated for flight training, but again found little use as being too small. 1947: Closed and handed over to the city. Victor Chapman, pioneer pilot. Chaffee AAF, Fort Chaffee, Fort Smith AR. Chatham Field, Savannah GA (19??-1950). Was Savannah AFB. CCTS and bombardment tng. Bombing and gunnery range at Townsend. The City of Savannah traded Hunter Field, then a municipal airport, for the smaller Chatham AFB to keep SAC and the USAF in Savannah. Chattanooga Aux #4, OK. Satellite for Frederick AAF. Chennault AFB, Lake Charles GA (19??-1963). Was Lake Charles AFB. BrigGen Claire L Chennault, USAAC/USAAF. Cheyenne Mountain AFB, AS, AFS, Colorado Springs CO (19??-->). 1994: To AS. 2000: To AFS. No rwy, non-flight ops only. Chino AAF, CA [33 58 30N, 117 38 12W] (19??). CCTS. Cal-Aero Academy (CPTP). To civil muni airport (19??). Childress AAF, TX. AFS bombardier tng. 17 bombing ranges. Churchill FS, NV. Satellite for Reno AAF. Circle Hot Springs AFB, AK. No data. Clanton ILF, AL [32 51 01N, 86 36 41W] (19??-??). 19?? : Became Gragg-Wade Field. Clear Springs AAF, New Braunfels TX (19??). To AFB (19??-67). Clear Springs Aux, TX. Satellite for Randolph Field. Clinton-Sherman AFB, Clinton OK (194?-6/x/1970). Was Burns Flat NAS (6/1/1943-19??). SAC base; tanker ops. Clipper Aux, CA [35 16 59N, 115 11 32W]. Satellite for Patton AAF (not verified). Clovis AAB, NM (1942-1943). Was civil Portair Field (c.1927) and Clovis Muni Airport (c.1935). CCTS - very hvy bomber; ground gunnery range. Bombing ranges at Melrose and Nara Visa. Reactivated as AFB (1951-1957). To AAF (1943-1947). Renamed Cannon AFB. Coalinga ALF, CA [36 16N, 120 36W] or [36 09 27N, 120 21 35W] ? (c.1943-1946). Was original Coalinga Muni Airport (1936-c.95). Used during WW2 as an emergency field by Lemoore AFB. Cochise ILF, AZ [32 02N, 109 55W] (19??-??). Coffeyville AFB, KS [37 05 41 N, 95 34 16 W]. CCTS. 4 local Aux Fields. Cold Bay, Fort Randall AK. College Park FF, MD (1911-??). Cologne Aux #7, TX. Satellite for Aloe AAF. Colorado Springs AAB, CO [38 49N, 104 43W] (1942). Was Colorado Springs Muni Airport (19??). Became Peterson AAF (1942). Columbia AAB, SC. CCTS; precision bombing tng. Satellites: Barnwell Muni, North Muni; bombing ranges at Lake Murray, Pontiac, Poorman. Became Owens Field. Columbus Aux #5, Aberdeen MS. Satellite for Columbus AAF. Concord AAF, CA [37 59 22N, 122 03 25W]. (1946) = Became civil Buchanan Field. Condron AAF see Stallion AAF. Congaree AFB, SC (1955). Transferred from USN. 1960: To ANGB. 19?? : Renamed McEntire ANGB. Connally AFB, Waco TX (19??-1968). Was Waco AFB. Advanced observer tng; TAC base. James Connally. Conners Aux, FL. Satellite for Hendricks Field. Consolidated-Vultee Aircraft Corp, San Diego CA. AAF Tech Training School. Cooke AFB, Lompoc CA (1957-1958). Was Camp Cooke. 1958: Renamed Vandenberg AFB. Cooter Aux #2, MO. Satellite for Blytheville AAF. Cordele Muni Airport, Aux #7, GA. Satellite for Turner Field. Corinth ILF, MS [34 54 30N, 88 36 00W] (19??-??). Corning Aux, CA [39 56 31N, 122 10 16W]. Coronaca AAF, Greenwood SC. Sub-base for Greenwood AAB. Coronado Aux #3, Tucson AZ. Satellite for Marana AAF. Corvallis AAF, OR [44-30, 123-17]. Ground support base. Joint USN? Courtland AAF, AL. Basic and advanced flight tng. Satellites: Anniston, Danville #1, Trinity #2, Bay #3. Coyote Flats Aux, CA [37 12 15N, 118 28 34W] (1968-c.1995). Satellite for Edwards FTC. Developed as a high-altitude test site for helicopters, being as it was at 10,000' the highest airport in the US. 642 acres, one 3000' paved runway, which degraded into a dirt strip. Taken over by USFS and closed for air operations because of its remoteness. Crawford Aux #3, TX. Satellite for Blackland AAF. Creech AAF, Lexington Army Depot KY.
Crestview ILF, FL [30 48N, 86 34W] (19??-??). Crews Field, Raton NM [36 44 30N, 104 30W] (19??-??). 19?? : Became Raton Muni-Crews Field. Crissy Field, Presidio of San Francisco CA [37 48 14N, 122 27 48W]. (192?-??) 91 Obsv Sqn, 15 Photo Sect (1931). 2610' paved rwy. Cruger Aux, MS. Satellite for Greenwood AAF. Crystal Aux #A-5, TX. Satellite for Pecos AAF. Cumberland ALF, MD (c.1930). ILF. Curtiss-Wright Corp, Caldwell NJ. AAF Tech Training School, propellers. Cut Bank AAF, MT. Sub-base for Great Falls AAB. Cyclopic Aux #1, AZ [35 44 24N, 114 04 30W]. Satellite for Kingman AAF. Daggett Muni Airport, CA [34 51 11N, 116 47 37W] (19??-??). CCTS. 19?? : Became Barstow-Daggett muni. Dale Mabry Field, Tallahassee FL. CCTS. Bombing ranges at Cross City, St Teresa, Sopchoppy. Dalhart AAF, TX (9/x/1942). B-17 and B-29 tng. Aux fields at Hitt and Wagner. 4 bombing and gunnery ranges. 4/x/1946: Became muni airport. Danville Aux #1, AL. Satellite for Courtland AAF. Darlington Co Airport Aux, SC. Satellite for Florence AAF. 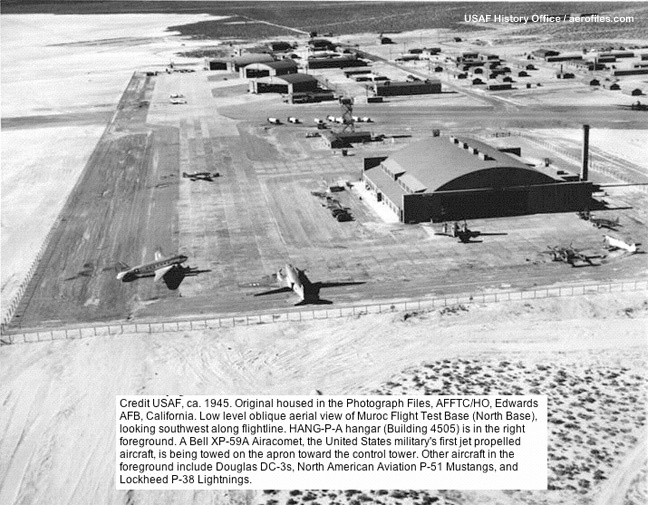 Dateland AAF, AFB, AZ [32 48 54N, 113 31 39W] (1943-1957). B-25 tng, flexible gunnery tng. Sub-base for Yuma AAF. 1946-1957: To AFX caretaker status with a skeleton maintainance crew. 1971-1977: Civil airport. In 1957 its buildings mysteriously caught fire and burned down. That proved to be the doing of the officer in charge, who had tired of the boring location and decided to destroy it in hopes it would result in it being abandoned, and his reassignment to a more exciting location. His plan worked in partthe field was indeed closed, but he was summarily court martialed. Davenport Aux #8, TX. Satellite for Randolph Field. Davidson Aux #2, OK. Satellite for Frederick AAF. Davis AAF, Adak AK (19??). Transferred to USN (1950). Davis-Monthan AFB, Tucson AZ (1927->). Was Tucson Muni (1924-1927). 8 bombing and gunnery ranges during WW2. Became TAC base, repair and storage (disposal) facility. Lt Samuel H Davis, USAS and 2Lt Oscar Monthan, USAS. Davison AAF, Fort Belvoir VA (9/2/1952->). BrigGen Donald A Davison, US Army. Dawson AAF, Camp Dawson WV. Dekker Aux, Ft Benning AL. Satellite for Lawson Field. Delamar Lake FS aka Drop Zone, Alamo NV [37 35 59N, 114 51 18W] likely (c.1962-??). Satellite for Edwards FTC as an emergency landing area for X-15 testsno structures, dry lakebed usable length: 15,000'. Used successfully in 1966 when X-15 suffered engine failure at 115,000' altitude. Delano AAF, Delano-Kern Co #3, CA [35 44 42N, 119 14 11W] (19??-??). Delaware Springs ILF, Carlsbad TX [31 51 21N, 104 32 38W] (19??-??). Dell FS, MT [44 44N, 112 43W] (19??-??). 19?? : To civil use. Demopolis Aux, AL. Satellite for Key Field. DeRidder AAB, LA (1941-1945). 1946-->: Became civil Beauregard Parish Airport. Desert Center AAF, CA [33 45N, 115 20W] (194?-??). Desert Rock AAF, Desert Rock NV. Destaville(?) Aux #7, AL. Satellite for Gunter Field. Detroit-Wayne Co Airport, MI (1960s). SAC dispersal site. De Valle AAB, Austin TX (9/18/1942-1943). 3/3/43: Became Bergstrom AFB. Dexter Aux #1, MO. Satellite for Malden AAF. Dillingham Field, Oahu HI (19??-1975). Was Kawaihapai Military Reservation (1927) and Mokuleia Airfield (deactivated 1948). 1975: To AAF. 1975-->: To joint-use civil. Dillon AFX, Eglin AFB Aux #10. Dobbins AFB, Marietta GA (1968). Was Marietta AAF/AFB (1950-1968). To AFR (1968), to AR (19??-??). Capt Charles Dobbins, USAAF. Dodge City AAF, KS [37 47 50 N, 100 07 08 W] ?. Flight tng. Satellite: Jetmore [37 59 04 N, 99 63 07 W]. Dodd Field, Ft Sam Houston TX (c.1930). See also Fort Sam Houston. Donaldson AFB, Greenville SC (19??-64). Was Greenville AFB. Dorr Field, Arcadia FL [27 11 53N, 81 40 07W] (1917-? ?, 1942-??). 1917: Contact Reserve Army Air Service tng. 1942: Reopened by John Riddle for contract AAF CPT tng. 19?? : Closed, became DeSoto Correctional facility. Dothan Airport Aux #2, AL. Satellite for Napier Field. Douglas Aircraft Corp, Santa Monica CA [34 01N, 118 28W]. AAF Tech Training School. Douglas Aircraft Corp, Long Beach CA. AAF Tech Training School. Douglas Field (ANG), Charlotte NC (19??-->). Was Morris Field. CCTS. To civil Charlotte/Douglas Intl Airport (19??). Dover AFB, DE (2/x/1951-->). CCTS. ATC and MAC. Dow Field, Greenfield ME, to AFB (194?-1968). Bombing range. Dow AAF, Camp Parks, Livermore CA, became Parks AFB?. Drew Field, Indian Rocks FL. AA gunnery range. Satellite: Hillsborough. Jeep gunnery target range at Poorman (Pinellas Co FL). Drummond Aux, OK. Satellite for Enid AAF. Dryden Airdrome, ILF, [30 03N, 102 13W] TX (c.1931-??). Border Patrol station and Army ILF. 19?? : Became civil Terrell Co.
Duke Field AS, AFX aka Eglin AFB Aux #3. Duncan Field, San Antonio TX (1930-??). HQ annex to Brooks and Kelly Fields. tng facility and repair depot. Dunlap Aux #A-4, Richgrove CA [35-75, 119-12] (1941-1946). Satellite for Minter AAF. Duluth Intl Airport MN (1952-->). Colocation, was Williams-Johnson civil airport. Dyersburg AAF, Memphis TN. CCTS. Gunnery range at Chisolm Lake; 3 bombing ranges. Dyess AFB, TX (9/1/1955-->) (?>12/6/1956). Was Abilene AB. SAC and TAC base; TCC ops, tanker ops. LtCol William E Dyess, USAAF. Eagle Field, Dos Palos CA [36 53 55N, 120 40 18W] (1942-1946). 5/15/1942: CPTP primary flight tng. Eagle Mountain AAF, Fort Worth Army Depot TX. Eaker AFB, Blytheville AR (19??-1992). Was Blytheville AFB. Gen Ira Eaker, USAAF/USAF. Eareckson AFS, Shemya Island AK (1993-??). Was Shemya AFB (19??-1993). 1994-?? : To AS. Easterwood Aux #4, College Station TX [30 36 16N, 96 21 39W]. Satellite for Bryan AAF. Edinburgh Aux #1, TX. Satellite for Moore Field. Edward Gary AFB see Gary AFB. Eielson AFB, AK (1946-->). Was Ladd Field satellite "Mile 26" (1942-1946). Carl Ben Eielson, Arctic explorer. Electra Aux #2, TX. Satellite for Sheppard Field..
Elizabeth AAF, NJ [41-14, 72-01] (19??-?? ), W end of Fishers Island, 5 miles off CT shore in Long Island Sound, 8 miles SE of New London. Elko Aux (aka Elko Dummy AF), VA [37 28 47N 77 13 47W] (1944-1946). Actually a decoy to draw potential enemy bombers away from Richmond AAB (Byrd Field) 5.5 mi WNW, but realistic enought to easily confuse errant pilots and to be noted on sectional charts. Only very vague marks of its trianglular shape can now be found in aerial photos (2008). Ellensburg Aux Field, AAF, WA. Ellis Aux #1, FL. Satellite for Marianna AAF. Ellsworth AAF, Rapid City SD, to AFB (1953-->). Was Rapid City AFB. BrigGen Richard E Ellsworth, USAF. Ellyson ALF, Pensacola NAS FL. Elmendorf Field, Fort Richardson, Anchorage AK (19??). 19? ?-->: To AFB. Capt Hugh Elmendorf, test pilot USAAC. El Mirage AFX, Palmdale CA [34-37, 117-36] (1942-1946). Satellite for Victorville AAF. Presently used for civil glider ops. Elmore Aux #2, AL. Satellite for Gunter Field. Emison Aux, IN. Satellite for George Field. England AFB, Alexandria LA (1950-1992). Was Alexandria AAF (1939-1946). TAC base; Air Commando tng. LtCol John B England, USAAF. Enid Muni Airport Aux #1, Woodring OK. Satellite for Enid AAF. Ent AFB, Colorado Springs CO (1949-1976). Was Army tent camp (1943-1949). No flight ops, but HQ for Army Air Defense Cmd, North American Air Defense Cmd, and Aerospace Defense Cmd; NORAD support base (Cheyenne Mtn). MajGen Uzal G Ent, USAAF. Ephrata AAB, WA [47 18 18N, 119 30 58W] (19??-??). CCTS. 5 bombing and gunnery ranges. 1950-?? : To AAF. 19?? : To AFB. 19?? : Became civil muni. Epler AFX aka Eglin AFB Aux #7. Erwin Aux, Newport AR (19??-??). Satellite for Newport AAF. Essex AAF see Camp Essex AAF. Essington Field, PA (2/x/1917-??). Army Aviation Section's fifth facility, that one specific to seaplane flight training. Estrella AAF, Paso Robles CA [35 40 15N, 120 37 36W] (1942-1944). Coastal defense. 9/2/42: Originally scheduled as a USMC base, but USN handed it over to AAF in deference to using nearby Lemoore NAS. 10/15/44: Deactivated. 11/27/44-->: Became Paso Robles Muni Airport aka Archie Dean Field. Ethan Allen AFB, Burlington VT (19??-1960). Was Fort Ethan Allen. Administrative and housing base, with flying operations at nearby Burlington Municipal Airport. Eugene Muni Airport, OR (194?-194?). Fairchild AFB, Spokane WA (1950-->). Was Spokane AFB. CCTS - ATC. Gen Muir S Fairchild, USAAF/USAF. Fairfield Air Intermediate Depot, Dayton OH (19??-??). Repair facility. Fairfield-Suisun AAF, Fairfield CA (19??-??). 19?? : Renamed Travis AFB. Fairmont AAF, NE [40 35 25N, 97 34 32W] (19??-??). OTU very heavy bomber. Falcon AFS, AFB, Colorado Springs CO [38 48 07N, 104 31 37W] (5/x/1983-1988). 6/x/88: To AFB. 6/5/98: Renamed Schriever AFB. Famoso Aux #A-3, CA [35 35 47N, 119 07 59W] OR [35 38 22N, 119 12 39W] (19??-??). Satellite for Minter Field. Needs site verification. Is Poso-Kern Co #16? Fannin Aux #10, AZ (19??-??). Satellite for Aloe AAF. Felker AAF, Fort Eustis, Lee Hall VA (1954-->). The world's first military heliport. Felts Field, Spokane (Parkwater) WA (19??-??). AAF Aux and utility. F E Warren AFB, WY (1949-->). Was Fort Francis E Warren (1930-1949) and Fort D A Russell (1884-1930). Under Army jurisdiction until reassignment to USAF in 1947. ISBM; MAC geodetic survey ops. First missile wing (1960-65). Francis Emory Warren, Wyoming territorial governor and US senator. Fighter Aux #3, Agua Frio AZ [33 37 52N, 112 21 56W] (19??-??). Satellite for Luke Field. Florence AAB, AAF, SC (19??-??). CCTS. Bombing and gunnery range at Sand Hills (McBee SC). Satellite: Darlington Co Airport. Forbes AFB, Topeka KS [38 57 05 N, 95 39 54 W] (1948-1973). Was Topeka AFB. TAC base; MAC photo-mapping ops. Maj Daniel S Forbes, USAF. Forney AAF, Fort Leonard Wood MO (19??-??). Forrest Aux, AZ [31-22-15, 109-40-29] (19??-??). Satellite for Douglas AAF. Fort Armstrong Air Depot, Honolulu HI (c.1930-??). Fort Belvoir see Davison AAF. Fort Benjamin Harrison see Schoen Field. Fort Benning see Lawson AAF. Fort Bliss Field aka Bliss Field, TX (6/12/1919-1925). 1st Aero Sqn action in Mexican Border War. US Border Patrol air unit established 1919. 1/25/1925: Became Biggs Field. Fort Bragg see Pope Field. Fort Campbell see Campbell AAF and Mackall/Simmons AAF. Fort Carson see Butts AAF. Fort Chaffee see Chaffee AAF. Fort Collins Airport, ILF, CO [40 35 47N, 105 08 07W] (19??-??).19?? : Became Christman Field Airport. Fort Crook ARB, ILF (c.1930-19??). Army fort established 1896. 19?? : Became Offutt AFB. Fort Devens AAF see Moore AAF. Fort Dix AAF, Wrightstown NJ. Fort Eustis see Felker AAF. Fort George Wright AAF, Spokane WA (19??-??). 19?? : Renamed George Wright AFB. Fort Greely see Allen AAF. Fort Harrison AAF, Helena MT. Fort Hood see Gray AAF and Hood AAF. Fort Jackson see Owens Field. Fort Kamehameha Field, Honolulu HI (c.1917-??). Balloon and airship ops. Fort Knox see Godman AAF. Fort Lawton AAF, Seattle WA. Fort Leavenworth see Sherman Field. Fort Lee AAF aka Lee AAF, Petersburg VA [27 17 04N 77 20 41W] (c.1957-c.1970). Apparently never used operationally as an airfield because of a scandal arising from misuse of government funds. 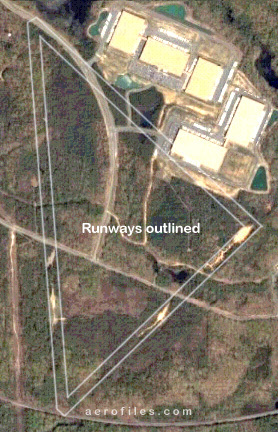 Its single, abandoned runway is still visible in aerial photos (2007) and reportedly had more recent use in VANG helicopter tng. Fort Leonard Wood see Forney AAF. Fort McClellan see Reilly AAF. Fort Meade see Tipton AAF. Fort Monroe see Walker AAF. Fort Ord AAF, Seaside CA [36 40 17N, 121 45 40W] (19??-1998). Was Camp Clayton. 19?? : Became Fritzsche AAF. Fort Polk AAF aka Polk AAF, Leesville LA. Fort Richardson see Bryant AAF. Fort Riley see Marshall Field. Fort Russell Field, Marfa TX. ILF (1931). Fort Rucker see Cairns AAF and Lowe AAF. Fort Sam Houston Aviation Cantonment (aka Air Center, San Antonio TX (1917-??). See also Dodd Field. Fort Sheridan see Sheridan Field. Fort Sill see Post Field. Fort Stewart see Liberty AAF. Fort Wadsworth see Miller Field. Fort Worth AAF, TX (19??-1948). Was Tarrant Field. AFS Assembly Plant #4. 1948: Renamed Griffiss AB, then Carswell AFB. Foster Field, Victoria TX (19??-1958). Fighter fixed gunnery tng. 6 numbered local Aux fields. Francis Warren AFB see F E Warren AFB. Franklin Aux, CA [38 18 19N, 121 25 45W] (19??-19??). Fresno ANGB, CA see Hammer Field. Fritzsche AAF, Fort Ord CA [36 40 45N, 121 45 46W] [36 40 17N, 121 45 40W] (c.1962-1991). 7/1/1991: Became civil Marina Muni. Furniss Aux #2, Cahaba AL (19??-19??). Satellite for Craig Field. Gainesville ILF, AAF, TX [33 40N, 97 08W] (19??-19??). Satellite for Perrin AAF. Galena AF, AK (19??-48). To AFB (1948-1993). Galveston AAF, TX (19??-19??). Tow target gunnery tng. Gunnery range at Oyster Bay. Garden City AAF, KS [37 55 54 N, 100 43 38 W] (19??-19??). Gary AFB, Camp Gary, San Marcos TX (19??-1955). Was San Marcos AAF. Flight instructor tng. 1955: Renamed Edward Gary AFB. Gaskin Aux #1, Dorchester TX (19??-19??). Satellite for Perrin AAF. Geiger Field, Spokane WA (19??-1960). AF Avn Engr tng. 1960--> Became civil Spokane Airport. General Motors Corp, Indianapolis IN (19??-19??). AAF Tech Training School, engines. George Wright AFB, Spokane WA (19??-1954). Was Fort George Wright AAF. Georgia AD SEE Warner Robins AFB. Gerstner Field, LA (1918-??). Renamed Lake Charles Avation Camp (19??). Is now Chennault muni? Gibbous Aux #1, Southmayd TX (19??-19??). Satellite for Perrin AAF. Gideon Aux #4, MO [35 26 36N, 89 54 14W] (19??-19??). Satellite for Malden AAF. Gila Bend Aux AAF, AFX, AZ [32 53 28N, 112 43 24W] (194?). Sub-base for Luke Field. Pilot tng. 3 numbered satellites shared with Luke and Williams AAF. 19?? : To AFX. Gilbert, AZ [33 25 21N, 111 40 19W] (19??-19??). INFO NEEDED or IS A TYPO? Gilbert Aux #1, AZ [33 23 12N, 111 40 19W] (19??-19??). Satellite for Williams Field. Glasgow AFB, MT [48 13 00N, 108 36 57W] (1957-1968, 1972-1976). Bombardment tng. 1972-76: Reactivated. Glendale AAF,, CA [34 09 47N, 118 17 19W] (194?-4?). Colocation at civil Grand Central Air Terminal. Goffs AAF, Goffs #2, Goffs CA [34 56 12N, 115 04 04W] (1943-c.1975?). 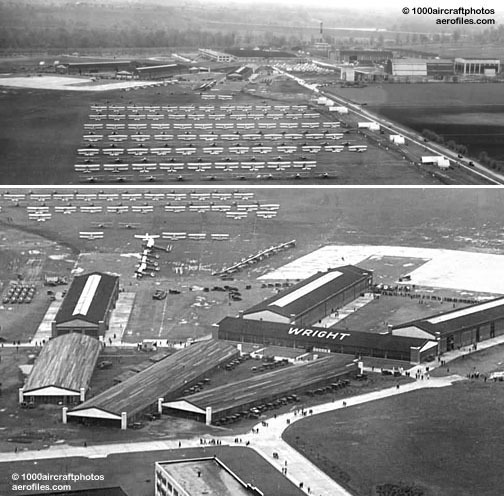 Service field for Camp Goffs, began with a 1500' gravel strip and evolved into two 4700' paved rwys. Sited about two miles E of the main camp. Goldman Aux, Stuttgart AR (19??-19??). Satellite for Stuttgart AAF. Goliad Aux #8, AZ (19??-19??). Satellite for Aloe AAF. Goodyear Aux #5, AZ [33 25 21N, 112 22 33W] (19??-19??). Satellite for Williams Field. Goodyear Aux #6, Liberty AZ [33 26 26N, 112 30 42W] (19??-19??). Satellite for Luke Field. Gore Field, Great Falls MT (1942-1948). ATC Ferry Group; high-altitude bombardment tng (Big Sandy). 1948: To Great Falls AAB/AAF. Gosport Field see Brooks Field. Gowen AAB, AAFB, Field, Boise ID [43 33 50N, 116 13 21W]. CCTS hvy bomber. 5 bombing ranges. Graham Aux, AZ (19??-1961). Existence or use unverified. Graham ILF, TN [35 53 00N, 87 29 00W] (19??-??). Grammer Aux #3, IN (19??-??). Satellite for Freeman Field. Grandfield Aux #3, OK (19??-??). Satellite for Frederick AAF. Grand Forks AFB, ND (9/x/1956->). SAC base; tanker ops. Grand Island AAF, NE (19??-??). OTU - very hvy bomber. Precision bombing range at Central City, gunnery range at Broken Bow. Grandview AAF, Kansas City MO (11/4/1955). Was civil Grandview Airport. 19?? : Became Richards Field, later Richards-Gebaur AFB. Grandview Aux, MO (19??-??). Satellite for Vichy AAF. Gray Butte Aux #4, CA [34 33 55N, 117 40 30W] (19??-??). Satellite for Victorville AAF. Gray Field, AAF, Fort Lewis, Tacoma WA (19??-??). 19?? : To AAF. Grayling AAF, Camp Grayling MI (19??-->). Helicopters. Multiservice use. Great Bend AAF, KS [38 28 50 N, 98 51 52 W] (3/5/1943-1946). Operation tng units, very hvy bomber. 4 bombing ranges. 1/1/1946: Deactivated. Great Falls AAB, MT (1948-1956 1948: Was Gore Field. 1956: Renamed Malmstrom AFB. Greenville AFB, MS (19??-1965). Advanced flight tng. Greenville AAB, SC (19??-??). CCTS. 19?? : Renamed Donaldson AFB. Greenville ILF, AL [31 51 00N, 86 42 30W] (19??-??). Greenwood Muni Airport Aux, MS (19??-??). Satellite for Greenwood AAF. Grenier AFB, Field, Manchester NH (19??-??). 19?? : To Grenier Field. Griel Aux #1, Tallassee AL (19??-??). Satellite for Tuskegee AAF. Griffiss AB, Fort Worth TX (1948-??). Was Ft Worth AAF. Became Carswell AFB (19??). Griffiss AFB, Rome NY (1948-1995). Was Rome AFB. LtCol Townsend E Griffiss, USAAF. Griffith Park Airport ANGB, Los Angeles CA [34 09 00N, 118 16 59W] (1931-1942). Was Griffith Park Aerodrome (1912-31), honoring Van Griffith for his donation of 100 acres of land with a request it be used to "do something to further aviation." Ceded to CANG to house its 40th Division, 115th Aero Obsv Sqn, commanded by Maj C C Moseley (who later was a founder of Western Airlines and Cal-Aero Tech Institute). One 1965' oiled rwy. Operations moved to Van Nuys AAF in 1942 and the field closed, became a veteran's hosing project briefly after WW2, then redeveloped as the present Griffith Park zoo and golf course. Gulfport AAF, MS (19??-??). CCTS - very hvy bomber. Bombing ranges at Cat Island and Bay St Louis. Gunshy Field, Meridian MS (c.1990-??). Was Meridian NAS OLF Alpha Field, transferred to USAF's Columbus AFB as aux and renamed. Hackberry Aux #3, AZ [35 26 19N, 113 47 58W] (19??-??). Satellite for Kingman AAF. Hagler AAF, Camp Shelby MS (19??-??). Half Moon Bay AAF Aux, CA [37 30 40N, 122 30 04W] (194?-194?). Hammer Field, Fresno AAB, Fresno CA [36 46 33N, 119 43 05W] (19??-1947). CCTS - night fighter. Sub-bases: Hayward AAF, Palmdale AAF, Visalia AAF. 1/15/1947: Became Fresno ANGB and civil Fresno Air Terminal (19??). Hammond AAF, LA (6/x/1943-??). Satellite for Key Field. Aux bombing and gunnery tng, as well as internment camp for POWs. Hammond ILF, TX [31 03 30N, 96 41 24W] (19??-??). Hancock Field, Syracuse NY (19??-1982). Was Syracuse AFS. Hanscom (civil) Field, Bedford MA (1941-?? ), colocation with civil ops. 19? ?-->: To AFB. Laurence G Hanscom, journalist and aviation advocate. Harding Field, Baton Rouge LA (19??-??). Harlingen AAF, TX (19??-1962). Observer tng; flexible gunnery tng. Harrisburg Muni Airport, PA (19??-??). Harvard AAF, NE (19??-??). OTU very hvy bomber. 5 bombing ranges. Hassayampa Aux #7, Arlington AZ [33 22 00N, 112 45 30W] or [32 31 41N, 112 55 58W]? (19??-??). Satellite for Luke Field. Hatbox Field, Muskogee OK [35-44-47, 95-24-48]. (19? ?-1947); ILF (1931)?. Satellite for Muskogee AAF. Became civil airport (194?). Hawes Aux #1, Barstow CA [34 55 21N, 117 22 36W] (1942-??). Satellite for Victorville AAF. 5600' rwy. 19?? : Became part of George AFB. Hawkins Field, Jackson MS (19??-??). 1941: To AAB. 1949: To civil Hawkins Field Airport. Hayward AAF, CA [37-40, 122-07]. Sub-base for Hammer Field. Night fighter tng. Became muni airport (1947). Hazen Aux, AR. Satellite for Stuttgart AAF. Headland Aux #3, AL. Satellite for Napier Field. Hearne Aux #2, TX. Satellite for Bryan AAF [30 52 14N, 96 37 14W]. Helendale Aux #2, CA [34 49 38N, 117 18 14W] ? (1942-c.1946). Satellite for Victorville AAF. Helm Aux #7, Lemoore CA. Satellite for Lemoore AAF. Henderson Aux #3, Millers Ferry AL. Satellite for Craig Field. Hereford Aux, AZ [31-25-00, 110-08-23]. Satellite for Douglas AAF. Hermosa Aux #A-2, TX. Satellite for Pecos AAF. Hickam Field, AFB, Honolulu HI [21 19 50N, 157 57 01W] (5/31/1935). 1957-->: To AFB. LtCol Horace M Hickam, USAS/USAAC pioneer. High Aux #A-1, TX. Satellite for Pecos AAF. Higley Field see Williams AFB. Hill Field, Ogden UT (12/1/39). Was Air Corps air mail depot (1931). To AFB (1948-->). Maj Ployer P Hill, USAAC test pilot. Hillsborough Aux, Tampa FL. Satellite for Drew Field. H J Paul AAF, Camp Ashland, NE. Holloman AFB, Alamogordo NM [32 50 58N, 106 06 12W] (1948-->). Was Alamogordo AAF (1942-??). 19?? : Became German Air Force Flying Training Center, subsidized by the German government, but controlled by USAF. Col George V Holloman, pioneer in guided missile research. Hood AAF, Fort Hood, Killeen TX (19??-->). See also Gray AAF. Gen John Bell Hood, Confederate Army. Hornersville Aux #3, MO. Satellite for Blytheville AAF. Howard Aux #3, Livingston CA. Satellite for Merced AAF. Hughes Field, Almansor NM. A nonesuch, appeared as this in 1943 film, "Bombardier," and subsequently found its way into several lists of AAF bases. The actual location was Kirtland Field at Albuquerque. Hurlburt Field, FL (3/x/1942). To AFB (19??-->). Was Eglin AFX #9. Lt Donald W Hurlburt, USAAF. Huron Aux #2, CA. Satellite for Lemoore AAF. Hunter Field, Savannah GA (19??). To AAFB (19?? ), to AAF (1967-1972, 1974-->). Current home of Columbia College of Missouri. Hunter-Liggett AAF, Jolon CA [35-59, 121-14]. Immokalee Aux, FL. Satellite for Hendricks Field. Indian Aux #3, CA. Satellite for Lemoore AAF. Indian Springs AF, AFX, NV (19??). Was muni airport. Flexible gunnery tng in WW2. Las Vegas Bombing & Gunnery Range; nuclear testing. To AFX (1964-?? ), presently the USAF's largest intallation in area (3 million acres). Inyokern Aux, CA [36-44-13, 118-08-41]. Satellite for Muroc AAF. Jackson AAB, MI. Troop induction, basic tng. Jackson ILF, GA [33 16N, 84 01W] (19??-??). Jasper ILF, FL [30 29N, 82 56W] (19??-??). Jetmore Aux, KS [37 59 04 N, 99 63 07 W]. Satellite for Dodge City AAF. Johns Island Airport Aux, SC. Satellite for Charleston AAF. Keesler Field, Biloxi MI (6/12/1941-->). Basic tng; tech schools. 2Lt Samuel R Keesler Jr, USAS observer. Kellogg AAB, Battle Creek MI. TCC. Kelly Aux #5, TX. Satellite for Hondo AAF. Kelly Field, AFB, San Antonio TX (5/7/1917-1948). Was Camp Kelly (1917). Pilot tng, MAC ops; TX ANG. 1948-2001: To AFB. Lt George E M Kelly, USAS. Kern-Tank Farm,Maricopa CA [est: 35 03 41N, 119 05 44W] (1943-19??). Gardner Field satellite. Kincheloe AFB, Kinross MI (1952-1977). Was Kinross AFB. Capt Iven C Kincheloe Jr, Korean War jet ace, USAF test pilot. King Salmon Airport, AK (1948-??). Was Nanek AAB. Army air ops. Kingsley Field, Klamath Falls OR (4/x/1956-19??). Was Klamath Falls muni and USN field. 2Lt David R Kingsley, USAAF bombardier. Kinross AFB, Kinross MI (1941-1945). 1952: Reactivated as Kincheloe AFB. Kinston AF, NC (19??-1953). Primary and basic tng. 1953: Renamed Stallings AB. Kirkwood Aux #2, CA [39 47 16N, 122 07 33W]. Satellite for Chico AAF. Kirtland Field, Albuquerque NM (1/x/1941). CCTS - very hvy bomber. To AFB (1971-->). Col Roy C Kirtland, USAS/USAAC. Kirtland ELF, NM. Satellite for Kirtland Field. K I Sawyer see Sawyer. Kissimmee AAF, FL. Sub-base for Pincecastle AAF. Knollwood Aux, Southern Pines NC. Satellite for Pope Field. Kougarok AFB, AK. No data. Lackland AFB, TX (4/12/1947-->). Was also San Antonio Aviation Cadet Center (1941-47); MOS assignments and classifications pool. 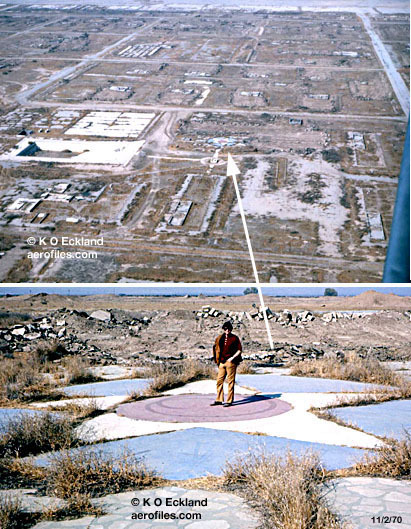 2001: Acquired Kelly AFB property. BrigGen Frank D Lackland, USAS/USAAC. Ladd Field, AFB, Fairbanks AK (1940). 19?? : To AFB. Became Wainwright AAF (1962-->). Gen Jonathan M Wainwright, US Army. Lafayette Muni Airport Aux, LA. Satellite for Esler Field. Laguna AAF, Yuma Proving Ground AZ (c.1943-->). Lake Charles AAB, AFB, LA (19??-??). Was Gerstner Field. CCTS - lt bomber; ground aerial gunnery range (Calcasieu LA). 5 bombing and gunnery ranges. Renamed Chennault AFB (19??). Lakeland AAF, FL (19??-??). OTU - fighters. Lake Park Aux #2, GA (19??-??). Satellite for Moody Field. Lambert Field, St Louis MO (1960s). SAC dispersal site. Lane Aux #4, TX (19??-??). Satellite for Goodfellow Field. Lane ILF, SC [33 29N, 79 53W] (19??-??). Langin Field, Moundsville WV (19??-??). ILF. Langley Field, Hampton VA [37 06N, 76 22W]. (12/30/1916-->). Proving ground for aviation experiments, then as tng field for WW1. 1931: Tactical School. 1938: 3 mi N of town on the peninsula between York R and James R; elev: 10; irregular 4500' x 2600' all-way sod field; seaplane base adjacent on SW branch of Back R, 10500' x 1800' sealane. 1942-->: To AFB; radar observer tng. Dr Samuel P Langley, aviation pioneer. The oldest continuously active military air base in the USA. Laredo AAF, AFB, TX [27 32 28N, 99 27 47W] (5/1/1942-1945, 1952-1973). Advanced flight tng, gunnery school. 1945: Inactive, became muni airport. 4/x/1952: Reactivated as AFB for basic jet flight tng; civil colocation. 1973: Closed, became civil Laredo Intl. Larson AFB, Moses Lake WA [47 12 16N, 119 18 59W] (19??-??). Was Moses Lake AAF. 19?? : Became civil Grant Co.
Las Animas Aux #2, CO (19??-??). Satellite for La Junta AAF. Las Vegas AAF, NV (19??-??). Renamed Nellis AFB (19??). Was Las Vegas AAC Gunnery School (1/25/1941-19??). Laurence G Hanscom Field see Hanscom Field. Lawton AAF see Fort Lawton AAF. Leadville AAF, CO (19??-??). Sub-base for Will Rogers Field (OK). League-Davis Aux #3, League City TX (19??-??). Satellite for Ellington Field. Lee AAF see Fort Lee AAF. Leesburg Aux #1, GA (19??-??). Satellite for Turner Field. Porterville AAF [36 02 44N, 119 01 18W] ? Lewiston AAF, MT [47 02 59"N, 109 27 44W] (19??-??). Bombardment tng, B-17. Libby AAF, Fort Huachuca AZ (19??-??). Joint civil and military. Renovated 1995. Liberal AAF, KS [37 02 38N, 100 57 49W] (19??-??). Flight tng, B-24. Liberty AAF, Fort Stewart, Hinesville GA (19??-??). Licthfield AZ [33 25 25N, 112 22 31W]. Limestone AFB, Caribou ME [46 56 48N, 67 53 22W] (2/25/1953-19??). Renamed Loring AFB (19??). SAC base. Lincoln AAF, NE (19??) (19??-??). Combat crew processing. To AFB (19??-1966). Lincoln Aux, CA [38-54-33, 121-21-05] (19??-??). Satellite for Mather Field. Little Rock AFB, AR (9/1/1955-->) (19??-??). SAC base. Lively ILF, VA [37 45N, 76 34W] (19??-??). Lockbourne AAB, Columbus OH (6/x/1942-19??). Renamed Rickenbacker AFB. Lockheed Airport, Burbank CA [34 11 20N, 118 19 51W] (19??-??). Factory and AAF flight test and repair facility; Tech Training School. Lockheed Air Terminal, Burbank CA [34-12, 118-21] (194?-->). Was civil Union/United Air Terminal (5/10/1930). Became civil Hollywood-Burbank Airport (19??-->). Logan Airport, Boston MA (1960s). SAC dispersal site. Logan Field, Dundalk MD (19??-??). ANG base, Army ILF. Lomita Flight Strip, CA (19??-??). Satellite for Long Beach AAF. Lordsburg Airdrome, AZ [32 20 02N, 108 41 32W] (c.1930). ILF. Loring AFB, Caribou ME [46 56 48N, 67 53 22W] (19??-1994). Was Limestone AFB. Maj Charles J Loring, USAF. Los Alamitos AAF, CA (19??-->). CANG and multiservice use. Los Angeles AFS, El Segundo CA (19??-??). 19? ?-->: To AFB; included Fort MacArthur Annex. Lost Hills Aux #A-8, CA [35 37 20N, 119 41 09W] (19??-??). Satellite for Minter Field. 19?? : Became civil Kern County #9. Lowry Field, Denver CO [39 42 58N, 104 53 33W] (2/x/1938-1994). Flying tng - very hvy bomber; Tech Training Ctr; airmen processing. 1948: To AFB. 8/30/94: Deactivated, became commercial and housing properties.Lt Francis B Lowry, USAS. Love Field, Dallas TX [32 50 43N, 96-50 58W] (10/19/1917-1927). ILF. 1927: Opened for civil use in colocation. Lt Moss L Love, USAS. Love Field, Hawes TX (c.1920). Temporary storage depot for WW1 surplus; no flight ops. Lowe AAF, Fort Rucker, Ozark AL (19??-??). Luke #12 reported, not found. Confliction in sites: 3 triangles on Google Earth IDs as Luke #8 (is #10?) [32 43 09N, 112 51 12W], #9 [32 39 27N, 112 52 14W], and #10 (is #8?) [32 36 21N, 112 52 41W]. Luke Aux #8, Phoenix AZ (19??-??). Satellite for Luke Field. Luke Field, Pearl Harbor HI [21 21 51N, 157 57 47W] (c.1919-??). Aerial coastal defense. Lumberton Airport Aux #2, NC (19??-??). Satellite for Lauringburg-Maxtin AAB. Lunken Airport, Cincinnati OH [39 06N, 84 25W] (19??-??). 1931: ARB and ILF. Luxora ILF, AR [35 45 30N, 89 57W] (19??-??). Mackall AAF aka Simmons AAF, Camp Mackall NC (1943-1945). WW2 airborne and glider pilot tng. Reverted to Army ground tng (1949->). Madera Aux #2, CA [37 19 58N, 120 24 35W] (1942-??). Satellite for Merced AAF. Malmstrom AFB, Great Falls MT (1956-??). Was Great Falls AAB/AFB. SAC base; missile support ops. 19?? : Rwy closed but still maintained. Helicopter operations only. Col Einar A Malmstrom, USAAF. Malone Aux #2, FL (19??-??). Satellite for Marianna AAF. Mana Airport see Barking Sands. Manchester ILF, TN [35 27N, 86 01W] (19??-??). 19?? : To agriculture development. Manila Aux #2, AR (19??-??). Satellite for Blytheville AAF. Mansfield Aux, LA (19??-??). Satellite for Baksdale Field. Marfa Aux #4, TX (19??-??). Satellite for Marfa AAF. Marietta AFB, GA (19??-1968). 1968: Renamed Dobbins AFB. Marks AFB, Nome Airport AK (19??-1950). Marin Meadows AF, San Rafael CA (12/1/1934-19??). Was San Rafael Air Corps Station. 19?? : Became Hamilton AFB. Mariposa Aux, CA [37 30 37N, 120 02 21W] (19??-??). Satellite for Merced AAF. 19?? : To muni airport. Marshall Field, Fort Riley, Junction City KS [39 03 09 N, 96 45 55 W] (c.1925-->). 1931: ILF. 3rd Tactical Air Cmd. 19?? : To AFB. 19??-?? : To AAF. Martindale AAF, San Antonio TX (c.1942-c.1946, 19??-->). Originally a satellite (Aux #4) for Randolph AAF. c.1946: Deactivated. 19?? : Reactivated. c.1990-->: To ANGB for helo tng. Marysville AAF Aux, CA [39 05 52N, 121 34 14W] (1942-1945). 1945: Became civil Yuba Co.
Maulsby Aux #2, MO. Satellite for Malden AAF. 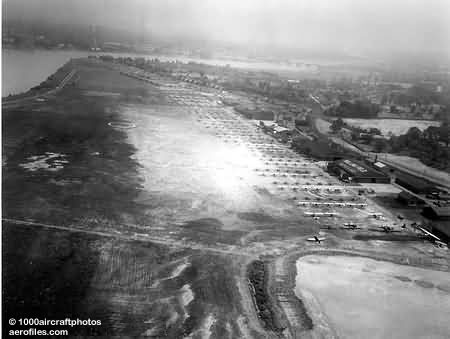 McChord Field, Tacoma WA (5/5/1938-->). Coastal defense. 1948-->: To AFB. Col William C McChord, USAAC. McClellan Field, Sacramento CA (4/29/1939-2001). 19?? : To AFB. Maj Hezekiah McClellan, USAAF. McCook AAF, Alliance NE (19??-??). OTU very hvy bomber. 4 bombing and gunnery ranges. McCook Field. Dayton OH (1917-??). McCoy AAF, Camp McCoy WI (19??-??). McCoy AFB, Orlando FL (1952-1974). Satellite for Orlando AAF. SAC base; tanker ops. Col Michael N W McCoy, USAF. McDona ALF, TX (19??-??). Satellite for Randolph Field. McEntire ANGB, Congaree SC (1961-??). Was Congaree ANGB. McGuire AFB, Trenton NJ (1949-->). Was Army's Rudd Field. Maj Thomas B McGuire Jr, USAAF. McGregor Aux #1, TX (19??-??). Satellite for Blackland AAF. McLemore Aux #4, AL (19??-??). Satellite for Gunter Field. McMillan AF see Camp Roberts. McNeal Aux, AZ [31 36 20N, 109 39 08W] (19??-??). Satellite for Douglas AAF. McRae ILF, GA [32 03N, 82 05W] (19??-??). Medina Aux #5, TX (19??-??). --Satellite for Randolph Field. Memphis Signal Corps Flying Field, TN (12/x/1916-??). The Army's fourth training facility, based at a former race track. Merced Aux #1 and #6, CA (19??-??). Satellites for Merced AAF. Mesa Miitary Airport aka Higley Field, AZ (9/x/1941-??). Became Williams AFB. Miami AAB, Muni Airport, FL (19??-??). Small arms tng. Mica AAF, VA. Satellite for A P Hill AAF (19??-??). Michael AAF [40 11 36N, 112 56 02W], UT (19??-??). Dugway Proving Ground aux. X-33 testing. Sometimes referred to as USAF's "other Area 51." Middletown AD, PA. Repair facility and ILF (1931-??). Midland AAF, TX (c.1941-1946). Bombardier tng base. 23 bombing ranges. 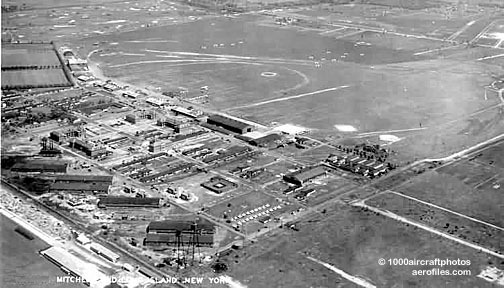 1946: Became municipal airport with many buildings converted to civic and commercal use. Miller AAF (Ray S Miller AAF), Camp Ripley MN (19??-->). Was Camp Ripley AF. Miller Field, Fort Wadsworth, Staten Island NY (1921-1940). 1921-19?? : To AAF. 1923: 102 Obsv Sqn NYNG, from Mitchel Field; unit moved to Ft McClellan AL on 10/15/1940. Mills Field, San Francisco CA (19??-??). Colocation with civil ops. 19?? : Became San Francisco Muni, then SFO. Millville AAF, NJ (1941-c.1947). Was Millville Flying Club Airport. CCTS - P-47. c.1947: Became civil airfield. Minden Muni Airport (Aux), NV (19??-??). Satellite for Reno AAF. Mineola Signal Corps Flying School, NY (7/x/1916-??). The Army's second flight training facility, used primarily for aviation experiments and testing. Mines Field, Los Angeles CA (19??-??). Colocation with civil ops. 19?? : Became Los Angeles Muni, later LAX. Minneapolis-St Paul Muni Airport, MI (19??-??). Minot AFB, ND (9/1/1958-->). SAC base; tanker and missile support ops. Mirage Aux #3, CA [34 37 24N, 117 35 54W] (19??-??). Satellite for Victorville AAF. Mira Loma SEE War Eagle Field. Mission Aux #2, TX (19??-??). Satellite for Moore Field. Mission Valley Aux #9 TX (19??-??). Satellite for Aloe AAF. Mitchel Field, Hempstead, Long Island NY (19??-1961). Lt John P Mitchel. Mitchel Field Sub-post #2, Hempstead NY (19??-??). WW2 Fighter Control. Mitchel Field Sub-post #3, Harbor Hill NY (19??-??). WW2 Fighter Control. Moffett Field, Mountain View CA [37-24-55, 122-02-55] (19??-??). Molette Aux #4, Orrville AL (19??-??). Satellite for Craig Field. Monoghan Aux, SC (19??-??). Satellite for Shaw Field. 9/12/45: Surplused. Montague Muni Airport, CA [41 43 45N, 122 32 37W] (1941-??). Satellite for Hamilton Field. Montgomery Air Intermediate Depot), AL (19??-??). Repair facility. Montgomery (muni) Airport Aux #6, AL (19??-??). Satellite for Gunter Field. Montgomery Aux #1, NY (19??-??). Satellite for Stewart Field. Montauk AFS, Camp Hero, Long Island NY (12/x/1953-19??). Moore AAF aka Devens AAF, Fort Devens, Ayer MA (1940-c.1997). Morris Field see Douglas Field. Morrison Field, West Palm Beach FL (19??-??). Small arms tng. Morrison Air Depot, VA (c.1920-??). Temporary storage depot for WW1 surplus; no flight ops. Moses Lake AAF, WA [47 12 16N, 119 18 59W] (19??-??). 19?? : Renamed Larson AFB. Moss Neck AAF, VA (19??-??). Satellite for A P Hill AAF. Moultrie Muni Airport (Aux), GA (19??-??). Satellite for Spence Field. Mountain Home AAB [43 07 52N, 115 43 46W], ID (1942-??). CCTS very hvy bomber. Gunnery range at Twin Falls ID. To AFB (19??-->). Mount Clemens AAB, MI (c.1926-1969). Became Selfridge AFB. Mount Meigs Aux #4, AL (19??-??). Satellite for Gunter Field. Muir AAF, Indiantown Gap Military Reservation, Annvile PA (1941-->). Army Natl Guard tng site. MajGen Charles H Muir, AEF (WW1). Muroc Lake Bombing Range, CA (1933-1941?). Murphy Dome AFS, AK (1951-->). Air Defense ops. Often claimed as named for a Lt Alex Murphy, whose helicopter crashed nearby in 1949, but its actual honoree was a legendary sourdough miner, John Murphy, who worked the area long before the site was built. Myrtle Beach AAF, AFB, SC (12/x/1956-1993). Operational base. Aerial gunnery tng; ranges at Brookgreen and Kiawah Island. 19?? : TAC base. Naknek AAF, AK (1951-1948). 1948: Became civil King Salmon Airport. Napa Aux, CA [38 12 48N, 122 16 44W] (194?-??). Satellite for Hamilton Field. Naples AAF, Ft Myers FL (19??-??). Nashville Muni Airport, TN (19??-??). Navasota ILF, TX [30 24N, 96 03W] (19??-??). Needles Aux, CA [34 45 46N, 114 37 26W] (19??-??). Satellite for March Field. Nellis AFB, Las Vegas NV [36 14 21 N 115 01 49 W] (19??-->). Was Las Vegas AAF. TAC base, CCTS. Home base for USAF Thunderbirds. Lt William H Nellis, USAAF. Nenana AF, AK (19??). To AFB (1948, reconstruction stopped at WW2's end). Newark AFB, Heath OH (19??-1996). Was Newark AFS and AAF. Newark Muni Airport, NJ (19??-??). New Bedford AAF, CT [41 40 37N, 70 57 31W] (19??-??). Newcastle AFB, DE (1951-??). Was Newcastle County Airport. New Hackensack Aux #3, ILF, Wappingers Falls NY [41 37 50N, 73 52 43W] NY (19??-??). Satellite for Stewart Field. New Hanover Co Airport, NC (1960s). USAF dispersal site. New Haven AAF, CT (19??-??). Tech Tranining School. New Orleans AAB, New Orleans LA [30-03, 90-02] (19??). Transferred to USN as Camp Leroy Johnson NAS (19??). New Orleans Lakefront Airport, LA (19??-->). Civil field used to train both AAF and USN pilots in WW2. New River Aux #4, Nashville GA (19??-??). Satellite for Spence Field. Niagara Falls Intl Airport, NY (1952-??). Colocation with civil ops. USAF dispersal site. Norfolk AAF, VA (194?-1945). CCTS. 1945: Deactived. Norman Park Aux, GA (19??-??). Satellite for Spence Field. North American Aviation Co, Inglewood CA (19??-1945). Tech Training School. 10/26/45: Deactivated. North Aux #3, TX (19??-??). Satellite for Lubbock AAF. Northern Field, Tullahoma TN. No data found. North Muni Airport, AAF, SC (19??-??). Auxiliary for Columbia AAB. Northrop Aviation Co, Hawthorne CA (19??-1945). Tech Training School. 10/26/45: Deactivated. North Smithville Aux #6, GA. Satellite for Turner Field. Norton AFB, Riverside CA [34 05 43N, 117 14 05W] (19??-94). 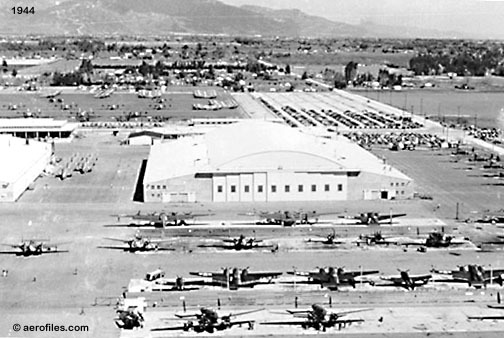 Was San Bernardino AFB. MAC base. Capt Leland F Norton, USAAF. Norton Field ARB, Columbus OH [39 58 10N, 82 52 48W]. ILF. Was civil Norton Field (6/30/1923-c.1948). Capt Fred W Norton, USAS. Oakland Airport, CA [37-43, 122-13]. Colocation for USAAF and USN. Offutt Field, Fort Crook, Bellevue NE (1924). Established as Army's Fort Crook (1896-1924). SAC HQ ARB. To AFB (1948-->). Lt Jarvis J Offutt, USAS. O'Hare Muni Airport, Chicago IL. SAC/USAF dispersal site. Oklahoma City AD, OK (1941-??). 1500 acres. Olmstead Field, Middletown PA (19??-1968). Air Materiel Cmd. Olnay Aux #6, TX. Satellite for Frederick AAF. Olympia AAF, WA [46 58 18N, 122 54 07W]. Onizuka AS, Sunnyvale CA (1994). 2000: To Sunnyvale AFS. Ontario AAF, CA [34 03 25N, 117 36 00W] (194?-1945). CCTS. 11/29/1945: Declared surplus, became civil intl airport. Opdyke Aux #4, TX. Satellite for Lubbock AAF. Orland Aux #1, Haigh Field CA [39 43 14N, 122 08 46W] (c.1942-c.1947). Satellite for Chico AAF. c.1947: Remanded to Glenn Co as civil airport. Orlando AAB, AAF, AFB (Muni Airport), FL (1942-1946). AAFSAT satellite tng site at Ballandale and Ocala bombing range. Included POW camp. 1946: Caretaker status. 1952: Reactivated as McCoy AFB. 1967: To USN. Oroville Aux #5, AAF, CA [39 29 21N, 121 37 10W]. Satellite for Chico AAF. Oscoda AFB, MI. Sub-base for Selfridge Field. CCTS - fighter. 19?? : Became Wurtsmith AFB. Oscura Aux, NM [33 29 31N, 106 10 57W]. Unsubstantiated or vague. Otis Field AFB, Falmouth MA [41 39 28N, 70 31 16W] (1938-1973). 1949: To AFB, properties to Cape Cod AFS and USCG station (1973-->). Was Otis Field, Camp Edwards (1938-1949). Lt Frank J Otis Moody, USAAC. Otto ILF, NM [35 04 18N, 106 00 18W] (19??-??). Owens Field, Columbia SC. Originally Fort Jackson Aux, then Columbia AAB (qv). Oxberry Aux, MS. Satellite for Greenwood AAF. Oxnard AFB, Camarillo CA [34 12 49N, 119 05 39W] (7/x/42). Was Ventura Co Airport. Sub-base for Van Nuys. CCTS - fighter. 1969-->: To civil Camarillo Airport. Ozark Aux #6, AL. Satellite for Napier Field. Page Field aka Palmetto Field [26 35 14N, 81 51 43W], Fort Myers FL. CCTS flight tng. 19?? : Became civil Ft Myers Metro. Paine AFB, Field, Everett WA (19? ?-1945, 1959-1972. Coast Defense base. 11/15/45: Declared surplus. (?> listed in 11/15/45 T.O.08-15-1 as Everett Paine Field). 1959-68: Reactivated and renamed Paine Field 1972: Properties to ANGB. Palestine Aux, IL. Satellite for George Field. 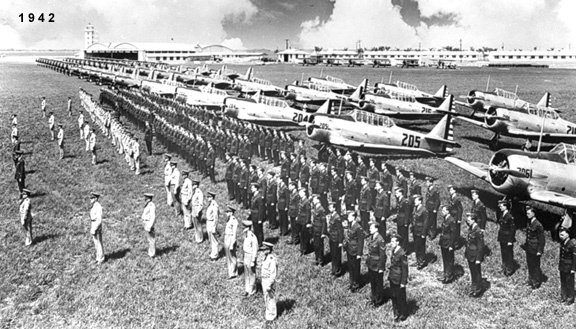 Palm Beach AFB, FL (19??-62). Palmdale AAF, CA [34 37N, 118 05W] (19??). Sub-base for Hammer Field. Palm Springs AAF, CA [33 49 51N, 116 30 25W]. ATC Ferry Cmd tng. Pampa AAF, TX. Pilot advanced flight tng. 4 numbered local satellites. Papago AAF, Phoenix AZ (19??). To ANGB (19??). Park Field, Memphis TN (11/x/1917) . Army Signal Corps Aviation tng camp. Military operations ended (11/13/1918) and the field was used for air mail operations and WW1 surplus storage, but soon fell into disrepair, then became an farming camp for transient field workers in the '30s. Redeveloped for USN as an air field to become Memphis NRAB (11/15/41) (qv). Parker, Maricopa CA [35 03 36N, 119 12 33W] (1946-19??). Gardner Field satellite. Parks AFB, Pleasanton CA [37 43 35N, 121 53 59W] (1953-1973). Was Camp Parks (1943-1946), also USN Seabees traning base (-1953). Acquired by USAF as AFB for induction and basic tng. 1959: Transferred to Army and operated in a standby status under the jurisdiction of 6th Army, Presidio of San Francisco. 1973: Partially surplused. 1980-->: Redesignated Camp Parks as Army Reserve Forces Training Area with two 2400' runways. Paso Robles AB see Estrella AAF. Patrick AFB, Cocoa Beach FL (10/1/1949-->). Reactivated, was originally Banana River NAS (c.1940), also Long-Range Proving Ground AFB (1950-??). MajGen Mason M Patrick, USAAF. Paul AAF see H J Paul AAF. Paynes Aux, MS. Satellite for Greenwood AAF. Pearson Field, Vancouver Barracks WA (19??). 1931: ILF. Pease AFB, Portsmouth NH (1946-1991). Was Pease Airport (1930s). 1942: Leased to USN. 1946: Rights transferred to USAAF. 1951: Strategic SAC base. 1966: Relocation of ANG and MAG airlift groups from Grenier Field (Manchester). 1991-?? : unkown use. 3/31/91: Closed, skeleton crew remained for disassembly and cleap-up. Capt Harl Pease Jr, USAAF. Peel AFX aka Eglin AFB Aux #4. Pendleton AAB, Muni Airport, OR. Perry AAF, FL. Precision bombing range. Perry Muni Airport Aux, OK. Satellite for Enid AAF. Peterson AAF, Field, AFB, Colorado Springs CO [38 48 34N, 104 42 21W] (5/6/1942-->). HQ Fighter Wing; NORAD support base; USAF Academy flight ops. 1951: To Peterson Field. 1976: To AFB. Lt Edward J Peterson, USAAF. Petrolia Aux #1, TX. Satellite for Sheppard Field..
Phillips Field see Aberdeen AAF. Picacho Aux #1, Tucson AZ. Satellite for Marana AAF. Piccolo AFX aka Eglin AFB Aux #5, FL. Pierce AFX aka Eglin AFB Aux #2, FL. Pinecastle AAB, AAF, Orlando FL (19??). Target range. Sub-base: Kissimmee AAF. Renamed McCoy AFB (19??). Pittsburgh AAB, PA (19??). (1931) ARB and ILF. Plattsburgh AFB, NY (7/14/1956-1994). SAC base; tanker ops. Was Plattsburg Barracks Army post (1812-1865), thereafter used intermittently by Army training units until acquired by USAF. 1994: Closed for budget cuts. Pocahontas Aux, AR. Satellite for Walnut Ridge AAB. Point Spencer AFB, AK (19??-48). Polk AAF see Fort Polk AAF. Portales, NM [34 10 43N, 103 22 23W]. Military use unsubstantiated or vague, no data found at USAFHA. Porterville AAF, CA [36 02 44N, 119 01 18W] (19??-??). Sub-base for Lemoore AAF (unverified). CCTS. Port Royal AAF, VA. Satellite for A P Hill AAF. Portsmouth AFB, NH (19??). 19?? : Renamed Pease AFB. Poso Aux #A-6, Bakersfield CA [35-35-48 119-07-41]. Satellite for Minter Field. Post Field, Fort Sill, Lawton OK (19??-??). 19?? : To AAF. Potter Aux #5, Merced CA. Satellite for Merced AAF. Powell Aux #6 aka Lake Havasu Aux, AZ [34 27 33N, 114 21 39W]. Satellite for Kingman AAF. Prairie Hill Aux #5, TX. Satellite for Waco AAF. Prairieville Aux, Almyra AR. Satellite for Stuttgart AAF. Pratt AAB, AAF, KS [37 42 18 N, 98 45 18 W] (5/x/1943-12/31/1945). OTU very hvy bomber (B-29). Bombing and gunnery ranges at Bucklin, Greensburg, Hopewell, Iuka, Kinsley. Presbyterian Aux, Denison IL. Satellite for Sturgis AAF. Presque Isle AAB (194? ), ME (19??). To AFB, some properties to Loring AFB (1961). Preston Aux #2, La Porte TX. Satellite for Ellington Field. Pulliam Aux #5, TX. Satellite for Goodfellow Field. Punta Gorda AAF, FL. CCTS - fighter; Fighter Cmd base. Pyote AFB, TX (19??-1954). CCTS - very hvy bomber. 5 numbered bombing ranges. Air Materiel District storage site (19??). Raco AAF, Aux, MI (1941-c.1955). Emergency use only; no personnel or buildings. Became a missle complex. Rankin Field, Tulare CA. 6 mi E of town [36 09 09.61N, 119 15 25.51W]. Contract pilot tng @ Rankin Aero Academy Inc. John "Tex" Rankin. Closed after limited post-war civil use. Faded USAAF insigne visible from the air (2007). Rapid City AAB, SD (19??). (1942) Was Weaver AFB. OTU - weather recon. Gunnery ranges at Newell, Rapid City, Sturgis, Washington Co. 19?? : To AFB. 1953: Renamed Ellsworth AFB. Redmond AAF, OR (194?-1946). Aircraft modifications, sub-base for Portland AAF. Aerial gunnery tng. 3 local bombing and gunnery ranges. Redstone AAF, Redstone Arsenal, Huntsville AL. Reed AAF, Sacramento Army Depot CA [38-31, 121-24]. Paved 3100' utility strip. Depot closed in 1995. Reese AFB, Lubbock TX (1949-1997). Was Lubbock AAF (1941-49). Basic multi-engine tng. Lt A F Reese Jr, USAAC. Reilly Field, Fort McClellan, Anniston AL. Rembert Aux, Sumter SC. Satellite for Shaw Field. 9/15/1945: Surplused. Rentschler Field, Hartford CT. HQ - Eastern Tech Tng Cmd. Rice AAF, CA [34 03 54N, 114 48 53W] (1941-??). One of several combat-ready, fall-back fields in the event of a Japanese attack on the West Coast. Richards Field, AFRB, Richards-Gebaur AFB, Kansas City KS (19??). Was Grandview AAF (19??-11/4/55). 1980: To AFRB. 1994: Renamed and reclassified as Richards-Gebaur AFB. Lt John H Richards, USAS, and LtCol Arthur W Gebaur, USAAF/USAF. Rich Field, Waco TX (c.1920). Temporary storage depot for WW1 surplus; no flight ops. Richmond Air Intermediate Depot, VA (c.1920-??). Supply Depot. Rickenbacker AFB, Columbus OH (19??-1980). Was Lockbourne AFB. Capt Edward V Rickenbacker, USAS/USAAC, WWI ace. Riesel Aux #1, TX. Satellite for Waco AAF. Riesel Aux #2, TX. Satellite for Blackland AAF. Rillito Aux #2, Tucson AZ. Satellite for Marana AAF. Rio Grande Aux #3, TX. Satellite for Moore Field. Risco Aux #3, MO. Satellite for Malden AAF. Rittehouse Aux #2, AZ [33 15 22N, 111 31 15W]. Satellite for Williams Field. River Aux #2, Aberdeen MS. Satellite for Columbus AAF. Robins Field, Jackson MS. 11.5 mi NE of town [32-26-45, 90-06]. Contract pilot tng @ MS Institute of Flying. 1944: Became civil Bruce Campbell Field. Robbins Aux #3, TX. Satellite for Goodfellow Field. Roberts East Aux, AAF see Camp Roberts. Robins AFB see Warner Robins AFB. Robinson AAF see Camp Robinson. Rockwell Field-Air Intermediate Depot, San Diego-Coronado CA. Early flight tng. Supply depot and repair facility, ILF (1931). Rocky Ford Aux, GA. Satellite for Spence Field. Rocky Ford Aux #1, CO. Satellite for La Junta AAF. Rodeo ILF, AZ [31 56N, 108 58 30W] (19??-??). Roe Aux, AR. Satellite for Stuttgart AAF. Rogers Field see Will Rogers Field. Rolla ILF, MO [37 59N, 91 43W] (19??-??). Rome AD, AAF, NY (1/1/42).19?? : To AFB . 1948: Renamed Griffiss AFB. Rosecrans Field, Saint Joseph MO. OTU - ATC. Ross Field, Arcadia CA [34-08, 118-02]. Origially pre-WW1 Army balloon base (c.1917); ILF (1931). #7 [32 51 08N, 104 28 02W] Artesia? Rudd Field, Trenton NJ (1937). Renamed McGuire AFB (1949). Ryan Aux #A-3, TX. Satellite for Marfa AAF. Sabre AAF, Location and info needed. Sacramento AD see Reed AAF. Sacramento Muni Airport, CA [38-30-48, 121-29-38]. CCTS. Sub-base: Chico. Sahuaro Aux #5, Tucson AZ. Satellite for Marana AAF. St Thomas Church Aux, IN. Satellite for George Field. Salinas AAB, Hollister CA [36-40, 121-36]. Radar operator tng; small arms tng. Salt Flat ILF, TX [31 44 50N, 105 05 27W] (19??-??). Salt Lake AAB, Salt Lake City UT (19??). Was civil Woodward Field. To ARB (1931). Sampson AFB, Geneva NY (19??). Some properties to Seneca Army Depot (1958). San Angelo AAF, TX. Bombardier Navigation tng. 1 local bombing range. San Antonio Army Aviation Post, TX (c.1914). Supply depot and repair facility (1931-??). Became San Antonio Air Depot (19??). San Antonio Aviation Cadet Ctr, TX (1941-1947). Renamed Lackland AFB. San Bernardino AAB, AFB, CA [34-05-43, 117-14-05] (3/2/1942-19??). Became Norton AFB. San Diego Signal Corps Flying School, North Island CA (c.1915). The Army's first pilot training facility. Sand Point ARB, Seattle WA. ILF (1931). San Rafael Air Corps Station, CA (1929-1934). 12/1/34: Became Marin Meadows AF, then Hamilton AFB (19??). Santa Ana AAB, CA. Small arms tng. Santa Maria AAF, CA [34-53-56, 120-27-27] (2/2/1942-1946). OTU - fighter. 1946: Became Santa Maria Muni. 19? ?-->: Renamed Allan Hancock Field. It was not, as sometimes reported, Hancock College of Aeronautics Field, which was a discrete private school selected by Gen H H Arnold in mid-1939 as a primary tng base for Army pilots. Santa Rosa AAF, Windsor CA [38-30, 122-48]. CCTS - fighter. Gunnery range at San Rafael, bombing range at Bodega Bay. Sarasota AAF, FL. Satellite for Winter Haven AAF. Savannah AB, GA (19??). Renamed Chatham AFB (19??). Sawyer AFB, MI (19??-95). Was K I Sawyer Airport. Kenneth I Sawyer, founder of original civil airport. Schriever AFB, Colorado Springs CO [38 48 07N, 104 31 37W] (6/5/1998-->). Was Falcon AFB. Gen Bernard A Schriever, USAF. Schilling AFB, Salina KS [38 48 13 N, 97 38 27 W] (19??-67). Was Smoky Hill AFB. Schoen Field, Ft Benjamin Harrison, Lawrence IN. RRB and ILF (1931-??). Scott Field, AFB, Belleville IL [38 32 27N, 89 50 56W] (6/14/1917-->). Originally an Army balloon and airship tng base through the '20s. Temporary storage depot for WW1 surplus (c.1920). Radio Mechanics tng. 19? ?-->: To AFB. Cpl Frank S Scott, USAS. Scottsbluff AAF, NE. TCC station. Scribner AAF, NE [41 36 46N, 96 37 55W]. Sedalia AAF, AFB, Warrensburg MO (1942-1947, 1951-1955). CCTS - TCC. Sub-base: Vichy AAF. 1951: Reactivated as AFB. 1955: Renamed Whiteman AFB. Seguin Aux #7, AFX, TX. Satellite for Randolph Field. Selah Airstrip see Vagabond AAF. Selfridge Field, Mt Clemens MI [42 36 49N, 82 50 12W] (19??). Was Mt Clemens AAF and Joy Field. CCTS - fighter. Sub-base: Oscada AAF. 1 local bombing range. 1971-->: To ANGB. Lt Thomas E Selfridge, USAS. Selma Muni Airport Aux #5, AL. Satellite for Craig Field. Selman Field (aka Flight Strip), Monroe LA. Was Monroe muni. Bombardier and navigator pre-flight tng. Semitropic Aux #A-5, Bakersfield CA [35 36N, 119 29W] ? (19??-??). Satellite for Minter Field. Seneca AAF, Seneca Ordnance Dept, Romulus NY (19??-??). Sequoia Airport, Visalia CA [36 26 50N, 119 19 08W]. 6 mi N of town. Contract pilot and ground tng @ Visalia-Dinuba School of Aeronautics. 1945: Became civil airport. Sewart AFB, Smyrna TN (19??-1970). Was Smyrna AFB. Maj Allan J Sewart Jr, USAAF..
Seymour Johnson Field, AFB, Goldsboro NC (6/12/42-5/31/46, 1956-->). CCTS - fighter. 4/1/56: Reactivated as AFB. ;. Lt Seymour A Johnson, USN. Shafter Aux AAF, Shafter-Kern Co #14, CA [35 30 21N, 119 11 29W] (19??-??). Sharpe AAF, Sharpe Army Depot, Lathrop CA [37 50 17N, 121 16 22W] (1941-c.1997). Single 3500' N utility rwy (c.1960-97). Shavers Summit AAF, CA. Sub-base for March Field. Shelby AAF, Camp Shelby, Hattiesburg MS (19??). Shemya AFB, AFS, Shemya Island AK (1948). 1954: Deactivated and became Shemya Airport. 1958: Reactivated as AFS, 1968: To AFB. 1993: renamed Eareckson AFS . Sheridan Field, Fort Sheridan IL. (19??-??) To AAF. (1931) To ILF. Sherman Field, ILF, Fort Leavenworth KS [39 22 08 N, 94 54 53 W] (1931-1998). AAF Staff School. 1953-->: To AAF. Sherman Field, Walnut Creek (Pleasant Hill) CA [37 56 46N, 122 03 28W] (c.1941). Sporadic joint USAAF/USN use as Coastal Defense satellite. 1946: Civil ops after the war until real eastate encroachment forced its closure c.1948. Sherwood Field, Paso Robles CA [35 36 52N, 120 39 21W] (3/3/1940-1945). Was civil airport (c.1932-40). CPT tng, joint USAAF/USN regional ops as satellite for Santa Maria AAF. 9/19/45: Remanded to city as civil airport (1945-c.1960). Shorter Aux #2, AL. Satellite for Tuskegee AAF. Sierra Army Depot see Amadee AAF. Signal Aux #7, AZ. Satellite for Kingman AAF. Sikeston MO. Unknown field name; primary tng in PT-19As. Simmons AAF see Mackall AAF. Sioux City AAB, Muni Airport, IA. OTU - very hvy bomber. Aerial gunnery ranges: Marshall Co (SD), Pierre (SD), Pierce Co (NE), Sergeant Bluff (IA). Bombing ranges: Buffalo Co (SD), Elk Point (SD), Knox Co (NE), Marshall Co (SD), Mitchell (SD), Stanton CO (NE), Yankton (SD). Slocum AAF, New Rochelle NY (19??). Was Fort Slocum. 1949-50: To AFB. Smoky Hill AFB, Salina KS [38 48 13 N, 97 38 27 W] (19??). CCTS - very hvy bomber. Bombing ranges: Osage City, Ottawa, Pottawatomie, Webaunsee. 19?? : Renamed Schilling AFB. Smyrna AAF, AFB, TN (19??-??). Instrument flying tng. 19?? : Renamed Sewart AFB. Somerville Aux #1, TX. Satellite for Bryan AAF. South Aux #1, Deming NM. Satellite for Deming AAF. South Aux #2, TX. Satellite for Lubbock AAF. South Aux #A-1, TX. Satellite for Marfa AAF. South Plains Field, Lubbock TX. Glider pilot tng. South Sulphur Aux #3, TX. Satellite for Majors Field. Spokane AAF (civil Felts Field), WA (19??). Spokane AFB, WA (1948-1950). 1947-48 (?>3/1/42-48): Was Spokane Army Depot. 1950: Became Fairchild AFB. Stallings AB see Kinston AF. Stallion AAF, NM (19??-->). Missile range included Condron Field/AFX for helicopers and fixed-wing aircraft; also NASA standby space shuttle crew tng. The largest military installation in the USA (3,200 sq mi). Standiford AFB, KY (19??-51). 1951-?? : Became Standiford Field. Stead AFB, Reno NV (1966-??) [39-30, 119-46]. Was Reno AAB. Steele Aux #1, MO. Satellite for Blytheville AAF. Stewart AFB, Hinesville GA. Became Camp Stewart AFB. Stinson Aux #7, Aberdeen MS. Satellite for Columbus AAF. Stinson Field, San Antonio TX. Air Technical Service Cmd Depot tng. Starkville Aux #8, MS. Satellite for Columbus AAF. Stockton Field muni airport, CA [37 53 36N, 121 14 28W] (19??-4?). Joint civil and military. Stout Field, Indianapolis IN TCC base. Strother Field, AAF, Winfield KS [37 10 09 N, 97 02 09 W] (1942-??). CCTS - fighter. Satellites: 3 numbered local Aux fields. To AAF (19??). 19?? : Became civil Strother Field. Suffolk County AAF, AFB, Westhampton Beach NY (5/17/43-??). Air Defense Cmd interceptor base during WW2. Sulphur Springs ILF, TX [33 09 35N, 95 37 16W] (19??-??). 19?? : Became Sulphur Springs muni airport. Sumter Muni Airport, Aux, SC. Satellite for Shaw Field. Sunnyvale AFS (USN facility), CA (19??). 1994: Renamed Onizuka AS. Syracuse AAB (Muni Field), NY (9/x/41). 19?? : To AFS. 19?? : Became Hancock Field. Sylvania Aux, SC. Satellite for Shaw Field. Taft-Kern #2, Taft CA [35 07 04N, 119 20 34W] (19??-??). Gardner Feld satellite. Confliction with Taft-Kern #2 [35 08 31N, 119 26 30W]. Taiban Aux #5, NM. Satellite for Fort Sumner AAF. Tallulah ILF, LA [32 24 57N, 91 08 57W] (19??-??). Taylor Aux #5, AL. Satellite for Gunter Field. Tarrant Field, Ft Worth TX (6/28/42-19??). Became Ft Worth AAF, Griffiss AB, Carswell AFB. Tchula Aux, MS. Satellite for Greenwood AAF. Temple Aux, ILF, TX [31 07N, 97 22W] (19??-??). Satellite for Blackland AAF. Thomasville AAF, GA. CCTS - fighter. Thornbrough AFB, Cold Bay AK (19??-53). Tifton Airport Aux aka AAF, GA. Satellite for Turner Field. Tintic ILF, UT [39 57N, 112 12W] (19?? ??). Tipton AAF, Fort Meade, Odenton MD. Tipton Aux #1, OK. Satellite for Frederick AAF. Tinker Field, Oklahoma City OK (1942-->). 9/x/19?? : To AFB. MajGen Clarence L Tinker, USAAF. Tobyanna AAF, Tobyanna Army Depot PA.
Toledo ILF, WA [46 28 45N, 122 48 15W] (19??-??). 19?? : Became Winlock-Ed Carlson Airport. Tonopah AAF, NV [37 47 40N, 116 46 43W]. (19??-c.1948). Tonopah Bombing Range (aka Test Range Airfield), NV (1942-??). Bombing and gunnery tng. 6600' airstrip built c.1965, lengthened to 12000' c.1977. Nellis AFB control authority. Topeka AAF, AFB, KS [38 57 05 N, 95 39 54 W] (8/22/42-1948). 1948: Renamed Forbes AFB. Topock Aux #5, AZ [34 43 46N, 114 26 20W]. Satellite for Kingman AAF. Topton Aux, Meridian MS (195?) [32-38, 88-37]. Satellite for Key Field. 1997: Became private residential airpark, Topton Air Estates. Toyah Aux #A-4, TX. Satellite for Pecos AAF. Travis AFB, Fairfield CA (19??-->). Was Fairfield-Suisun AAF. MAC base. BrigGen Robert F Travis, USAF. Trinity Aux #2, AL. Satellite for Courtland AAF. Troy Muni Airport, AL. Satellite for Tuskegee AAF. Tucson AAB, AZ (1941-??). Completed in only 4.5 months by WPA. HQ 1 Bomb Wing, 41 Bomb Grp (Med). Tucson Field AZ. ILF (1931). Tulsa Muni Airport. 6 mi NE of town. Contract pilot tng @ Spartan School of Aeronautics. Post-was became part of Tulsa Intl. Tye AAF, Camp Barkeley, Abilene TX (4/28/42) (?>6/3/43). P-47 flight tng. Decommissioned (12/13/45) and remanded to Texas ANG. 4/15/56: Renamed Abilene AB, then Dyess AFB (12/6/56). Tyndall Field, Panama City FL (12/7/41-->). Flexible Gunnery tng. Bombing range at St George Island. Lt Frank B Tyndall, USAAC..
USAAF Technical School, Sioux Falls SD. USAF Academy Airstrip, Colorado Springs CO [38 58 20N, 104 49 03W]. USAF Academy Bullseye Aux, Colorado Springs CO [38 45 30N, 104 18 03W]. Union City Airport, TN. 4.5 mi SE of town. CPT pilot tng @ Riddle Aero Institute. Post-war to civil Everett-Stewart Airport. Vagabond AAF, Yakima Training Center WA, incorporated 2000' paved Selah Airstrip (5300' with dirt overrun). 19?? : Became a private airport. Valdosta Airport Aux #5, GA. Satellite for Moody Field. Val Verde Aux, Del Rio TX. Satellite for Laughlin AAF. Vance AFB, Enid OK [-?-]. (1949-->). Was Enid AFB. Pilot basic multi-engine tng. LtCol Leon R Vance Jr, USAAF. Vancourt Aux #6, TX [-?-]. Satellite for Goodfellow Field. Vandenberg AFB, Lompoc CA (10/x/1958-->). Was Camp Cooke AB (c.1942). SAC base, Western Missile Test Range. MajGen Hoyt S Vandenberg, USAF..
Van Nuys AAFB, CA [34-12-35, 118-29-24] (1942-1946). CCTS. Sub-base: Oxnard AAF. Wartime activation of Los Angeles Metropolitan civil airport, which would become Van Nuys Airport. Vaughn Aux #2, Columbus MS. Satellite for Columbus AAF. Venice AAF, FL [-?-]. CCTS - fighter. Vichy AAF, MO [-?-]. TCC. Sub-base for Sedalia AAF. Satellite: Grandview. Ventura Co Airport [34-12-02, 119-12-25], Oxnard CA. Mira Loma Flight Academy civil contract base for USAAF pilot tng. 1945: To County for civil use. Vernon ILF, TX [34 16N, 99 18W] (19??-??). Vidalia-Lyons Aux #8, GA [-?-]. Satellite for Turner Field. Vina Aux #3, CA [-?-]. Satellite for Chico AAF. Vincent AFB, Yuma AZ (19??). Was Yuma AAF. Became MCAS Yuma (1960),. Visalia AAF, CA. Sub-base for Hammer Field. Volk Field ANGB, Camp Douglas WI (1935-->). Was Natl Guard Camp Williams (1927-1935). Lt Jerome A Volk, USAF. Wagner AFX aka Eglin AFB Aux #1. Wainwright AAF see Ladd Field. Walcott Aux, AR. Satellite for Walnut Ridge AAB. Walker AAF, KS [38 53 35 N, 99 05 52 W] (1/x/1943-1/31/1946). Orginally slated as a satellite for Smoky Hill AAF, instead became a major B-29 tng base. Walker AAF, Fort Monroe, Hampton VA.
Walker AFB, Roswell NM [33 18 03N, 104 31 19W] (1948-1967). Was Roswell AFB. 1/13/1948: SAC. Gen Kenneth N Walker, USAF. 6/30/67: Deactivated for economy. Became civil Roswell Industrial Ctr. Wall Aux #7, TX. Satellite for Goodfellow Field. Walla Walla WA. CCTS - hvy bomber. Gunnery and bombing ranges at Boardman Flight Strip (OR), Harder (Benge WA), Lake Co (OR), Mill Creek (Walla Walla). Joint civil and military. Wallkill Aux #2, NY. Satellite for Stewart Field. Walnut Ridge AAB aka Army Flying School, AR. CCTS - fighter. Satellites: Pocahontas, Walcott. Walseth AFB, Seward AK (1948-??). Walterboro AAF, SC (7/x/1942-??). CCTS - fighter. Satellite for Columbia AAB. War Eagle Field, Lancaster CA [34-42-06, 118-14-00]. Mira Loma Flight Academy civil contract base for USAAF pilot tng. Satellites: Liberty Field, Victory Field. 19?? : Became a county jail, then an INS detention center. Warner-Robins AFB, Macon GA (3/x/1942-->). Was Georgia Air Depot and Wellston Army AD. MAC and SAC base; tanker ops. BrigGen Augustine Warner-Robins, USAAF. Warren AFB see F E Warren AFB. Wasco Aux #A-1, CA [35-37, 119-21]. Satellite for Minter Field. Became civil Kern County #5. Water Works Aux #4, Columbus MS. Satellite for Columbus AAF. Waukomis Aux, OK. Satellite for Enid AAF. Waycross AAF aka Homerville Bombing & Gunnery Range, ??. Wayne County Airport, Romulus MI. Weaver AFB, Rapid City SD (1942). 19?? : Renamed Rapid City AFB. Webb AFB, TX (1952-1977). Was Big Spring AFB. Advanced flight tng. Webb Aux, AZ (1943-1946). Satellite for Douglas AAF. Weide AAF, Edgewood Arsenal MD. Weldon Aux, Newport AR. Satellite for Newport AAF. Wellston Army AD see Warner-Robins AFB. Wendover Bombing Range, AAB, AFB, AFX [40 43 05N, 114 01 56W], UT (c.1938-1976), as part of Fort Douglas (8/12/1941). Was also an early civil DoC emergency field (1930s). 3/28/42: Became AAB, P-47 fighter tng, B-17 and B-29 bomber tng during WW2. 12/31/45: As Ogden Air Logistics Ctr, German rockets evaluation and testing facility. 1947-10/1/49: To AFB. 1954: Airfield reactivated and transferred to Ogden UT as AFX (1958-1/x/69). 6/16/76: declared surplus and turned over to the city as muni airport, but range area was retained for TAC exercises. West Aux #1, TX. Satellite for Lubbock AAF. West Aux #5, CA. Satellite for Lemoore AAF. West Aux #4, TX. Satellite for Blackland AAF. West Leesburg Aux #3, GA. Satellite for Turner Field. Westover Field, AFRB, Chicopee Falls MA (4/x/1940). CCTS. 1974-?? : To AFRB. MajGen Oscar Westover, USAAC. West Point Mattaponi VA [37 31 05N 76 45 43W] (c.1944-??). USAF dispersal field for Richmond AAB, 31 mi W; not used for flight ops. Post-WW2 civil airport. West Smithville Aux #2, GA. Satellite for Turner Field. Wheeler Field, AAF, Schofield Barracks, Oahu HI (6/20/1923). To AAF (1993->). Maj Sheldon H Wheeler, USAS. Wheeler-Sack Field, AAF, Pine Camp aka Camp Drum, Great Bend or Watertown? NY (19??). to AAF (19??). Whiteman AFB, Sedalia MO (1955-->). Was Sedalia AAF. SAC base. 2Lt George A Whiteman, USAAF. White Sands Harbor, Alamogordo NM [32 56 37N, 106 25 10W]. While not officially a USAF site, it is included as an object of interest in being NASA's training facility for space shuttle landings. Several very lengthy dirt rwys (eg: 36,900') can be seen from the air. Wichita AAF, KS [37 37 22 N, 92 16 08 W] (5/5/1951-??). 19?? : Became McConnell AFB. Wickenburg Aux #4, AZ [33 44 41N, 112 38 00W]. Satellite for Luke Field. Wicksburg AAF, AL (c.1942-1998). Was Wicksburg Aux #1. Satellite for Napier AAF (seen on some maps as Allen Field and Allen AAF). Willow Run Airport, AFS, Ypsilanti MI (19??). Avn Mechanic tng. 19?? : To Willow Run AFS. Willows-Glenn Co Aux, CA [39 30 58N, 122 13 03W] (1942-1946). Satellite for Hamilton Field. Winslow AAF, AZ [35-01, 110-43]. Winters-Davis AAF, Aux [38 35N, 121 51W], CA (194?-4?). Withycombe AAF, ARNG, Oregon City OR [45-24, 122-32] (19??-??). Wittman Aux #1, AZ [33 43 04N, 112 31 43W] (19??-??). Satellite for Luke Field. Wolters AFB, AAF, Mineral Wells TX (19??). To AAF (1956-??). Woodward Airport, Camden MI (19??-??). Woodward Aux, OK (19??-??). Satellite for Will Rogers Field. Woodward Field, Camden SC (19??-??). 3 mi E of town. RAF tng @ Southern Aviation School. Woodward Field see Salt Lake City AAB. Wright Aeronautical Corp, Paterson NJ. 25th AAF Techical Tng Detachment. Wright Field, Dayton OH as Wilbur Wright Field (1917-1927), then Wright Field (1927-1931). Orville & Wilbur Wright. Became Patterson Field, then Wright-Patterson AFB. Wright-Patterson AFB, Dayton OH (1/13/1948-->). Was Patterson Field. Wright Brothers and Lt Frank Patterson, USAS test pilot. Wurtsmith AFB, Oscoda MI (19??-1993). Was Oscada AFB. MajGen Paul B Wurtsmith, USAF. Yoakum ILF, TX [29 19 15N, 97 13 45W] (19??-??). 19?? : To agriculture development. Youngstown Muni Airport, OH (19??-??). Yuma AAF, Muni Airport AZ (19??-??). Radar Observer tng. Bombing and ground gunnery ranges. 4 numbered local Aux fields. 19?? : Became Vincent AFB. Zanesville ILF, OH [40 00 25N, 82 00 47W] (19??-??). 19?? : Became Parr Airport. Zenas Aux #5, IN (19??-??). Satellite for Freeman Field. Zuehl Aux #6, AFX, TX (19??-??). Satellite for Randolph Field.